提供了一种方案，用于通过协作注册表在实体间聚集和链接位置数据。 It provides a solution for aggregating and linking location data through collaboration between entities registry. 一个位置资源服务应用接收来自提供方的用以指明位置信息的输入，所述位置信息至少部分地包括从所述提供方可用的与在地理地点处的位置相关的内容的描述。 A resource location specified in the service application for receiving input position information from the provider, the location information comprises at least in part from the provider may use the location associated with the description of the geographical location of the content. 所述位置资源服务应用从所述位置信息确定位置。 The application determines the position location service resource from the location information. 所述位置资源服务应用在一个注册表中，至少部分地基于所述确定的位置，聚集所述位置信息与从一个或者多个其它提供方可用的其它位置信息。 The locations of the resource in a registry service application, at least in part on the determined position, the position information gathered from one or more other other location information provided before use. 服务提供方(例如，无线、蜂窝、因特网、内容、社交网络等)和设备制造商一直被挑战着例如通过提供竞争性的网络服务并改进潜在的技术来为消费者带来价值和便利。  service providers (eg, wireless, cellular, Internet, content, social networking, etc.) and equipment manufacturers have been challenged to deliver value to consumers, for example by providing a competitive network services and improve the potential of technology and convenient. 一个感兴趣的领域正在发展中，以通过因特网聚集位置相关信息。 One area of ​​interest is developing in order to gather location-related information via the Internet. 例如，一个位置(例如，商店， 餐馆，旅店等）暂时性地和在空间上与一个地理地点（例如，一个地址)相关，并且经常依据多种非标准的媒体格式而被表示出来。 For example, a location (for example, shops, restaurants, hotels, etc.) and temporarily associated with a geographical location (for example, an address) in the space, and often based on a variety of non-standard media formats are represented. 因此，服务提供方和设备制造商面临重要的技术挑战，以使得不同的数据提供方(例如，位置数据提供方)可以识别并链接来自于不同来源的与特定位置相关的信息。 Therefore, the service provider equipment manufacturers face significant technical challenges, so that different data providers (for example, position data providers) to identify and link information related to a specific location from different sources. 因此，需要一种途径来聚集和链接来自于不同来源或者实体的位置数据。  Accordingly, a need for a way to gather and link data from different sources or the position of the entity. 根据一个实施例，一种方法包括:接收来自提供方的用于指明位置信息的输入，所述位置信息至少部分包括从所述提供方可用的与在地理地点处的位置相关的内容的描述。  According to one embodiment, a method embodiment comprising: receiving an input for indicating the position information from the provider, the location information provider may include at least a portion of content associated with the geographic location from the location at description of. 所述方法还包括:从所述位置信息确定位置。 The method further comprising: determining the location information from the location. 所述方法进一步包括:在一个注册表中，至少部分地基于所述确定的位置，聚集所述位置信息和从一个或者多个其它提供方可用的其它位置信息。 The method further comprising: in a registry, at least in part on the determined position, and the location information gathered from one or more other other location information provided before use. 根据另一个实施例，一种设备包括:至少一个处理器;和至少一个存储器，其包括计算机程序代码，所述至少一个存储器和所述计算机程序代码配置为与所述至少一个处理器一起至少部分地使得所述设备接收来自提供方的用于指明位置信息的输入，所述位置信息至少部分包括从所述提供方可用的与在地理地点处的位置相关的内容的描述。  According to another embodiment, an apparatus embodiment comprising: at least one processor; and at least one memory including computer program code, the at least one memory and the computer program code configured to, with the at least one processor together such that at least part of said apparatus receives an input for specifying a provider of the location information, the location information comprises providing at least in part from the description and the geographic location associated with the content at the site of use only. 所述设备也被使得从所述位置信息确定位置。 The apparatus is also determined such that the position information from the position. 所述设备被进一步使得在一个注册表中，至少部分地基于所述确定的位置，聚集所述位置信息和从一个或者多个其它提供方可用的其它位置信息。 The device is further such that in a registry, at least in part on the determined position, and the location information gathered from one or more other other location information provided before use. 根据另一个实施例，一种计算机可读存储介质，其携带一个或者多个指令的一个或者多个序列，其中当被一个或者多个处理器所执行时，所述指令序列至少部分地使得一个设备接收来自提供方的用于指明位置信息的输入，所述位置信息至少部分包括从所述提供方可用的与在地理地点处的位置相关的内容的描述。  According to another embodiment, a computer-readable storage medium carrying one or more sequences of one or more instructions which when executed by the one or more processors, at least a portion of said sequence of instructions receiving an input to such a device for indicating the position information from the provider, the location information comprises at least a portion of the provider may use the content from the description related to the geographic location of the site at. 所述设备也被使得从所述位置信息确定位置。 The apparatus is also determined such that the position information from the position. 所述设备进一步地被使得在一个注册表中，至少部分地基于所述确定的位置，聚集所述位置信息和从一个或者多个其它提供方可用的其它位置信息。 The apparatus further being such that in a registry, at least in part on the determined position, and the location information gathered from one or more other other location information provided before use. 根据另一个实施例，一种设备，其包括用于接收来自提供方的用于指明位置信息的输入的装置，所述位置信息至少部分包括从所述提供方可用的与在地理地点处的位置相关的内容的描述。  According to another embodiment, an apparatus embodiment which comprises means for receiving inputs for specifying the position information from the provider, the location information comprises at least a portion of the geographic location provided with only from the described at the location of the relevant content. 所述设备还包括用于从所述位置信息确定位置的装置。 The apparatus further includes means for determining a position for said position information. 所述设备进一步包括用于在一个注册表中，至少部分地基于所述确定的位置，聚集所述位置信息和从一个或者多个其它提供方可用的其它位置信息的装置。 Said apparatus further comprising means for a registry, at least in part on the determined position, the position information and gathering means other only by the position information from one or more other providers. 从下面的详细描述一一仅举例说明了一些包括视为实施本发明的最佳模式的特定实施例和实现一一可以清楚地理解本发明的其它方面、特点和好处。  From the following detailed description is merely illustrative of some of the eleven considered including the best mode embodiments of the present invention to the particular embodiments and implementations eleven clearly understood that other aspects, features and advantages of the present invention. 本发明还可以是其它和不同的实施例，并且其多种细节可以以各种明显的方面而修改，而不脱离本发明的精神和范围。 The present invention may also be of other and different embodiments, and its details may be a variety of various obvious respects and modifications without departing from the spirit and scope of the invention. 因此，附图和实施例描述在本质上被认为是描述性的而不是限制性的。 Accordingly, the drawings and described embodiments are to be considered illustrative in nature and not restrictive. 图12是可以用于实施本发明实施例的移动终端(例如手机)的一个图示。  FIG. 12 is a graph can be used to implement embodiments of the present invention, a mobile terminal (e.g., handset). 公开了用于通过协作注册表在实体间聚集和链接位置数据的方法、设备和计算机程序的例子。  Examples of a method for gathering location data and the link between the entities through collaboration registry, apparatus and computer program is disclosed. 在下面的描述中，出于解释的目的，给出了各种特定的细节以提供对本发明实施例的透彻的理解。 In the following description, for purposes of explanation, numerous specific details are given to provide a thorough understanding of embodiments of the present invention. 但是，对于本领域技术人员清楚的是，可以在没有这些特定的细节的情况下而实施本发明实施例，或者可以使用等同的布置来实施本发明实施例。 However, the skilled person it is clear that the present invention may be implemented without these specific details of the embodiments, or equivalent arrangements may be used to implement the embodiments of the present invention. 在其它的例子中，公知的结构和设备以方块图的形式显示以避免使得本发明的实施例不必要地难懂。 In other instances, well-known structures and devices are shown in block diagram form in order to avoid such an embodiment of the present invention unnecessarily obscure. 如在此所使用的，术语“位置”指的是地点的语义/使用。  As used herein, the term "position" refers to a semantic / place of use. 尽管位置经常与物理地点相关联，但是其是一个与地点独立的对象。 Although often associated with a physical location of locations, but it is a separate object with the location. 也就是说，一个位置(例如，餐馆、部门等)随着时间可以改变其物理地点（即地理坐标），并且多个位置(例如，旅店和餐馆）可以与相同的地点相关联。 That is, a location (e.g., restaurants, department, etc.) over time may change its physical location (i.e., the geographical coordinates), and a plurality of positions (e.g., hotels and restaurants) may be associated with the same location. 因此，位置暂时地在空间上与一个地理地点相关联。 Therefore, the position temporarily in space with a geographic location associated. 通过唯一地指示位置的对应属性集合(位置元数据）的值集合(位置元数据），将一个特定位置与其它位置区分开。 Value set (location metadata) by a corresponding set of attributes (metadata position) uniquely indicates the position of a particular position separated from the other location area. 除了唯一地指示特定位置的位置元数据(例如名字、地点、类别、联系方式等)之外，还有位置资源(例如图片、地图、视频、人员、产品/服务、可用产品/服务的菜单、设施等），它们进一步地描述了位置。 In addition to the metadata that uniquely indicates the location of a specific location (such as name, location, category, contact information, etc. ), there are location of the resource (such as images, maps, videos, personnel, product / service, available products / services menu, facilities, etc. ), which are further described position. 上述位置资源可以作为一个或者多个网络资源，例如一个或者多个文件、目录、网页、或者其组合的集合，而被提供，这些网络资源可通过对应的统一资源标识符(URI)、统一资源定位符(URL)和/或其它的标识符而访问。 The position of one or more resources as network resources, such as one or more files, directories, web pages, or a set of combinations, and are provided, these network resources by a corresponding uniform resource identifier, a universal resource (URI) locator (URL) and / or other identifiers accessed. 如在此所使用的，术语“资源”指的是可以被定义在语义性网页中用于完成项目活动的数据或者任何其它，例如人、装置、设备、资金等。  As used herein, the term "resource" refers to data that can be used to define the complete activity or any other item, such as a human, apparatus, device, funds semantic Web page and the like. 在数据管理中，考虑资源调度、可获得性以及优化。 In data management, resource scheduling considerations, availability and optimization. 资源可以是一个服务提供给其用户的数据或者使其用户分享的数据。 Resources can be a service to its users' data or their data shared by users. 相似的例子包括：电子文档、图片、服务(例如今天的证券交易有关的财经新闻）和一些其它资源。 Similar examples include: electronic documents, pictures, services (such as today's securities transactions relating to financial news) and other resources. 要注意的是，不是所有的资源是从网络获取的，例如人、装置、设备、资金、图书馆中的精装书等就不是。 It should be noted that not all the resources are obtained from the network, such as people, equipment, facilities, funds, libraries and other hardcover book is not. 例如，抽象的概念可以是资源，例如数学公式中的操作符和操作数、关系的类型（例如父母或者雇员）或者数值(例如，零、一和无穷大）。 For example, the abstract concepts can be resources, such as the type of operators and operands mathematical formula, the relationship (such as a parent or employees) or value (eg, zero, one and infinity). 倘若概念被给予身份，不管该概念通过信息表示格式(例如资源描述框架三元组(RDF triple))或者结构(例如RDF图像)而被表达，或者其身份通过给定一格式完整的统一资源标识符(URI)来表达，这样上述的概念也可以是资源。 If the concept of identity is given, regardless of whether the concept is expressed presentation format (e.g. triplets Resource Description Framework (RDF Triple)) or a structure (e.g. RDF image) by the information given by its identity or a complete Uniform Resource Identifier format Fu (URI) is expressed, such as above can be a resource. 如在此所使用的，术语“基于位置的服务(LBS)”指的是一种可通过网络进行访问并且利用该能力对终端的地理位置进行使用的信息服务。  As used herein, the term "location-based services (the LBS)" refers to a network and can be accessed by using the location capabilities of the terminal used by the service information. 基于位置的服务可以被使用在各种环境中，例如导航、娱乐、健康、工作、个人生活等。 Location-based services can be used in various environments, such as navigation, entertainment, health, work, personal life and so on. 基于位置的服务包括用于识别人或者对象的位置的服务，例如发现最近的银行取款机或者朋友或者雇员的行踪。 Location-based services include identifying the location of people or objects of services, such as the recent discovery of the whereabouts of bank teller machines, or friends or employees. 基于位置的服务包括基于位置的商业活动(例如贸易和维修、批发、财经、法律、个人服务、商业服务、通信和媒体），基于位置的电子商业活动(例如在线交易、优惠券、营销、广告等）、住宿、不动产、 租赁、建造、就餐、交通和旅行、旅行向导、地图和导航、包裹/运载工具的追踪、个人天气服务、基于位置的游戏等。 Location-based services including those based business location (such as trade and repair, wholesale, finance, legal, personal services, business services, communications and media), based on electronic commerce location (such as online trading, coupons, marketing, advertising etc. ), accommodation, real estate, leasing, construction, dining, transportation and travel, travel guide, maps and navigation, parcel / vehicle tracking, personal weather services, such as location-based games. 尽管针对使用通过网络传输的超文本传输协议(HTTP)消息中嵌入的扩展标记语言(XML)，在网络服务、一个或者多个客户端应用和注册表(包括永久位置ID服务、位置元数据服务和位置资源服务)之间交换位置元数据，讨论了本发明的多个实施例，但是本发明的实施例不限制于所述上下文。  Although for the use of the network by transmitting a hypertext transfer protocol embedded (HTTP) message, an extensible markup language (the XML), service network, the one or more client applications and registry (permanent location including the service ID, location exchanged between the service and the location of the resource metadata service) location metadata, discussed a number of embodiments of the present invention, embodiments of the present invention is not limited to the context. 可以明确地期望的是，可以使用任意一些嵌入在任何网络协议或者人机界面中的属性和值来交换所述元数据，其中所述人机界面是在网络社区成员和一个或者多个运行在计算设备中的一个或者多个进程之间，并且可以具有或者不具有网络。 Can clearly desirable that any number may be used in any network protocol or embedded HMI attributes and values ​​of the metadata exchange, wherein the man-machine interface is a network and one or more members of the community in the run between a computing device or a plurality of processes, and may or may not have a network. 图1是依据一个实施例，可以通过一个协作注册表在实体之间聚集和链接位置数据的系统的图示。  Figure 1 is one embodiment of the system illustrated and may be aggregated link position data between a cooperative registry entity. 很多的实体(例如个人、商业组织、公益组织等)提供基于位置的内容、产品和/或服务，它们涉及与位置相关的资源(例如商业目录、地理信息系统、餐馆指南、旅店预定服务、商店优惠券等）。 Many entities (such as individuals, business organizations, public interest organizations, etc.) to provide location-based content, products and / or services, they involve resources associated with the location (such as business directories, geographic information systems, restaurant guides, hotel reservation services, shops coupons, etc.). 这些实体中的每一个管理其位置的特定元数据集合。 Each set of specific metadata management of its position of these entities. 对于这些实体中的一些，从各种资源中聚集元数据是一个艰巨的任务。 For some of these entities, gather metadata from a variety of sources is a daunting task. 为了确保数据质量和完整性， 典型地各个所述实体不得不自己实施数据验证、数据丰富以及冗余去除（例如识别出实体不经营了或者搬到不同地点了）。 To ensure the quality and integrity of data, each of said entity typically have their own data verification embodiment, a wealth of data and redundancy removal (e.g., a business entity is not identified or moved to a different location). 但是，它们的元数据集合不会被标准化，这导致了难以根据不同的资源聚集位置元数据。 However, they are not standardized set of metadata, which leads to difficult to gather location metadata according to different resources. 这就需要一个系统来可以简单地检查是否来自于两个实体的两个元数据集合指的是同一个位置，并且高效地和有效地在实体间进行位置元数据的聚集和链接，并同时确保数据质量，避免数据重复。 This requires a system that can simply check whether the two metadata from the set of two entities refer to the same position, and efficiently and effectively collect the metadata and link position between entities, while ensuring data quality and avoid duplication of data. 很多网站，特别是搜索引擎，使用爬行作为一种手段以提供最新的数据(包括位置数据）。  Many websites, especially search engines use to crawl as a means to provide the latest data (including location data). 一些一般的搜索引擎使用网页爬行以有条理自动的方式或者按顺序的方式来浏览万维网，以创建所有被浏览过的网页的拷贝，并建立被下载的网页的索引以用于快速检索。 Some general search engines use automated web crawling in an organized manner or in a sequential manner to browse the World Wide Web, to create a copy of all the visited pages and index pages are downloaded for quick retrieval. 爬行程序也被使用来从网页中收集特定类型的信息，例如地点信息。 Crawlers also be used to collect a particular type of information from the Web, such as the location information. 但是，网页爬行不可准确地识别一条给定的信息所指的位置，地点数据的自动聚集包含重复和/或冲突的信息。 However, the crawling can not accurately identify the location of a given information referred to automatically place data comprising information gathering repeated, and / or conflict. 尽管各种媒体格式包含机制来增加地点相关的元数据到/内置于所述内容中，多数这些机制不能够标识位置，而仅仅标识其地点。 Although various mechanisms to increase media format comprises meta data related to the location / built in the content, most of these mechanisms are not able to identify the location, but merely identifies its location. 作为一个示例，所述爬行程序不区分旅店的老地址和旅店现所存在的地址，这样两个被列出的地址导致了冲突。 As one example, the crawler does not distinguish between old inn inn current address and the address is present, so that two addresses listed cause conflict. 即使一些服务可以从多个地点中区分出位置来，它们不能识别资源和位置的关系（例如：“一张埃菲尔铁塔的图片”和“一张来自埃菲尔铁塔的图片”）。 Even if some services can be distinguished from multiple locations in the position, they do not recognize the relationship between resources and the location (for example: "a picture of the Eiffel Tower" and "a picture from the Eiffel Tower"). 这就需要具有一种能力，例如通过合适的元数据标准，来识别地点后面的一个位置，并识别资源和位置之间的关系。  This need to have a capacity, for example by a suitable standard metadata to identify a position behind the place, and identify relationships between the resources and location. 但是，语义性的网络主动的历史表明即使有这种标准存在，也没有导致元数据标准的广泛采纳的机制存在。 However, the semantic web initiative of history shows that even with such standards exist, there is no mechanism leading to widespread adoption of metadata standards. 为了解决这个问题，图1中的系统100引入了通过协作注册表在实体间进行位置数据的聚集和链接的能力。  In order to solve this problem, the system 100 of FIG. 1 introduces the capability for aggregation and data link position by cooperation between entities registry. 系统100遵循协助方法，由资源拥有方建立位置相关的资源的网络目录。 100 system to follow the assistance methods, the resources have to enter into a position relevant network directory resources. 所述资源拥有方在协作注册表中公布它们的网络资源、相应的网络链接和相关的位置元数据，以便聚集数据到一个在语义云中的位置相关资源的目录中，在其中位置资源和指向所述位置资源的链接的分组可以被保存、组织和更新。 Has released the resource side thereof in cooperative registry of network resources, corresponding network links and associated location metadata, to aggregate data into a directory location related resources in the semantic cloud, the position of which point to the resource and Block Chaining the location of the resource can be saved, organized and updated. 这个注册表依据位置对于这些链接进行注册和分类。 The registry based on the location registration and classification for these links. 所述目录可以被实体用于相互链接它们的网页。 The directory may be linked to each other entities for their web pages. 作为一个例子，旅店/餐馆预定服务将其网页链接到一个在线旅行向导用于其对应的旅店/餐馆评论。 As an example, hotel / restaurant reservation service to its website links to an online travel guide for the corresponding hotel / restaurant reviews. 系统100定义了每个位置资源类型(例如评论、产品、服务、工作、住房等)的标准化的位置元数据格式，以使得在多个实体间实现聚集和链接位置内容。  system 100 defines the location of each resource type (such as reviews, products, services, work, housing, etc.) standardized location metadata format, so that to achieve link aggregation and location content between multiple entities. 通过示例，基于所述位置元数据(例如名字、地点、类别、联系方式等），所述位置内容或者其广告可以与到资源的链接一起而显示给用户。 By way of example, based on the position metadata (e.g., name, location, type, contact information, etc. ), the location of the content or advertisement which may be displayed together with a link to the resource to the user. 所述位置元数据标准也可以被嵌入在位置内容中。 The location metadata can also be embedded in a standard position in the content. 系统100使得资源拥有方可以基于标准化的位置元数据格式(例如位置ID、位置的描述、服务、URL、评论等)注册其资源，并保证列在位置资源注册表（即协作注册表）中的资源对于对其进行引用的用户和其它资源拥有方是可以获取的。  The system 100 can be registered owner of that resource which is the resource location based on standardized metadata formats (e.g. location ID, location descriptions, service, URL, comments, etc. ), and to ensure (i.e., listed in the cooperating position of a resource registry registry ) resources for users and other resources referenced by the owning them can be obtained. 系统100也支持基于标准化的位置元数据格式使用其它的位置注册表服务进行位置数据的聚集/链接。 The system also supports 100 other locations registry service aggregation / link location data based on a standardized location metadata format. 当一个网络服务(包括一个或者多个网站)采用标准化的位置元数据格式时，系统100可以基于标准化的位置元数据格式直接从所述网站获取位置内容。  When a network service (including one or more sites) using standardized metadata formats location, the system 100 may obtain location content from the location of the website based on standardized metadata formats directly. 当相同的元数据机制也被一与所述注册表相关联的搜索引擎所使用时，资源拥有方/公布方可以通过所述注册表简单地发现所感兴趣的位置内容并集成位置内容(基于所述标准化的位置元数据格式）。 When the same metadata mechanisms have been used by a registry associated with the search engines, resources have side / side published content may simply find the location of interest and integrated by the registry location content (based on the said normalized location metadata format). 作为一个例子，所述标准化的位置元数据格式包括两个不同格式，用于资源（例如图片)和位置(埃菲尔铁塔)之间的两个关系，以便两个资源“埃菲尔铁塔的图片”和“来自于埃菲尔铁塔的图片”被清楚地区分开以便由实体相应地进行聚集和链接。 As one example, the position of the normalized metadata formats include two different formats, for a relationship between two resources (such as images) and a position (the Eiffel Tower), so that the two resources "picture of the Eiffel Tower" and " from the Eiffel Tower pictures "are clearly separated for aggregation and link accordingly by the entity. 系统100因此聚集通过注册新位置和/或更新位置内容，由提供方连续地扩展的大位置注册表/目录。  The system 100 thus gathered by registering the new location and / or update the content, the provider is continuously extended large location registry / directory. 所述提供方通过注册表/目录，在实体之间和在涉及基于地点的资源的应用之间，对所述位置数据和元数据进行链接/分类。 The provider through the registry / directory, between the entity and the location-based applications involving between resources, the metadata, and location data link / classification. 所述位置注册表/目录使得其数据库可以被其它的位置目录、搜索引擎和涉及位置相关的资源的实体所访问。 The location registry / database directory so that it can be accessed by other location directory, search engines and relates to a physical location associated with the resource. 在所述注册表/目录中的列表会使得一个位置被自动注册和/或更新到许多其它目录、搜索引擎和涉及位置相关资源的实体中。 In the list of registry / directory will make a location is automatically registered and / or updates to a number of other directories, search engines and location-related entities involved resources. 这些实体可以提供一个网页，其引用了复杂的旅游预订搜索引擎的位置，其中所述旅游预订搜索引擎包含位置、旅馆、飞机票、汽车出租等。 These entities can provide a web page that references the location of the complex travel booking search engine, which includes the travel booking search engine position, hotels, airline tickets, car rentals and so on. 使用所述提供方协作地维护所述位置注册表/目录的方式是经济的。 Use the provider cooperatively maintain the position of the registry / directory of the way the economy. 访问所述系统100可进一步地使得实体不用自己维护所述实体的位置的核心元数据(例如名字、地点等）。  The system 100 may further access to such entities do not have to maintain the position of the central entity metadata (e.g., name, location, etc.). 系统100假定负责对位置的核心元数据进行验证和丰富，并提供机制以避免重复产生和合并已有的重复，并使得实体在一个公开可访问的目录中注册它们自己资源和与位置相关的产品/服务。 100 system assumes responsibility for the core metadata to verify the location and rich, and provides a mechanism to avoid duplication and generate merge the existing duplication and making entities register their own resources and location-related products in the directory publicly accessible /service. 通过使得很多提供方贡献出相同的被共享的位置资源， 单一提供方的努力被杠杆式放大以获得对位置数据的更广阔范围的访问，这对于一个提供方单独来建立是不可能的。 Many providers by making contributions to the same position is shared resources, a single provider efforts are amplified leveraged to gain access to a broader range of the position data, which for a single provider to set up is not possible. 所有的提供与位置相关的资源(例如内容、服务、产品等)的实体可以使用位置TD来互连它们的资源。 All provide location-related resources (such as content, services, products, etc.) of entities may use their position to interconnect TD resources. 如图1所示，系统100包括用户设备(UE) 101a，其通过通信网络105连接到个人计算机101b、网络服务平台103a、通信平台103b WElOla、个人计算机101b、网络服务平台103a、 通信平台l〇3b中的每一个具有位置资源服务应用107和用于存储信息的数据库109。  As shown in FIG. 1, system 100 comprises a user equipment (UE) 101a, which is connected via a communication network 101b to the personal computer 105, the network service platform 103a, the communication platform 103b WElOla, a personal computer 101b, a network service platform 103a, the communication l〇3b each platform has a service application 107 and the location of the resource database 109 for storing information. 网络服务平台103a和通信平台103b可以提供例如音乐服务、地图服务、视频服务、社交网络服务、 内容广播服务等的服务。 Web services platform 103a and 103b may provide a communication platform services such as music services, mapping services, video services, social networking services, such as content broadcasting service. 特殊地，UEl Ola和个人计算机10 Ib各自具有数据库109a和数据库10%以用于存储位置资源信息。 Specially, UEl Ola and the personal computer 10 Ib with 10% each for storing resource information database 109a and the position database. 网络服务平台103a和通信平台103b各自具有数据库109c和数据库l〇9d用于存储位置资源信息。 Internet communications network service platform 103a and 103b, and 109c each having a database for storing location database l〇9d resource information. 网络服务平台103a通过通信网络105使用位置资源服务应用107c将位置数据注册/链接到注册表，并且UElOla经通信网络105使用位置资源服务应用107a获取位置资源信息。  Network Service Platform 103a through a communications network resource location services application 105 uses the position data register 107c / linked to the registry, and UElOla location via a communication network 105 uses the resource service application 107a acquires position information of the resource. 为了简单起见，图1描述了在系统I 〇〇中仅一个UE10 Ia和个人计算机101 b。 For simplicity, FIG. 1 depicts only a UE10 Ia and the personal computer 101 b in the system I took office. 但是，可以设想的是，系统100可以支持任意数量的用户终端一直到通信网络105的最大容量。 However, it is contemplated that system 100 can support any number of user terminals up to the maximum capacity of the communication network 105. 例如，网络容量可以基于可获得的带宽、可获得的连接点等等而确定。 For example, network capacity may be determined based on the available bandwidth, the available connection points and the like. 如前所述对于系统100,位置资源服务应用107a使用用户的环境信息和偏好信息以自动地产生与导航POI相关的个性化的呈现以呈现到UElOl上。 For the previously described system 100, the resource location service application 107a using environment information to user preference information and automatically generates a personalized presentation associated with the POI navigation to present to the UElOl. 在图1的例子中，利用一个位置的位置ID，提供方可以在网络105上标识关于位置的信息和服务位于其中的特定位置资源，例如通过一个用于链接到该位置的说明和服务的网页的URL来标识。 In the example of FIG. 1, a position using the location ID, and the information provider may identify services in specific locations on the location where the resource on the network 105, for example by means of a link to the service description and location of the web the URL is identified. 在一些实施例中，基于该URL，这样的网页可以被在提供方的节点中的浏览器所访问。 In some embodiments, it based on the URL, so that the page can be accessed by a browser in the provider node. 在其它的实施例中，单独的位置资源不被使用。 In other embodiments, the position of the individual resources are not used. 作为示例，系统100的通信网络105包括一个或者多个诸如数据网络(未示出）、无线网络(未示出）、电话网络(未示出）或其任意组合的网络。  As an example, the system 105 includes a communication network 100 such as one or more data networks (not shown), a wireless network (not shown), a telephone network (not shown), or any combination of the network. 可以设想的是，数据网络可以是任意局域网(LAN)、城域网(MN)、广域网(WAN)、公共数据网络(例如因特网）、短距离无线网络或任意其它合适的分组交换网络，例如商业化所有的专有分组交换网络，例如专有电缆或者光纤网络等或者任意其组合。 It is contemplated that the data network may be any local area network (LAN), metropolitan area networks (the MN), a wide area network (WAN), a public data network (e.g. the Internet), short range wireless network, or any other suitable packet-switched network, such as commercial All of proprietary packet-switched networks, such as fiber optic cable or a proprietary network or the like, or any combination thereof. 此外，无线网络可以例如是蜂窝网络，并且可以使用各种的技术，包括增强型数据速率全球演进(EDGE)、通用分组无线服务(GPRS)、全球移动通信系统(GSM)、IP多媒体子系统QMS)、通用移动通信系统(UMTS)等，以及任意其它合适的无线媒体，例如全球微波接入互操作性(WiMAX)、长期演进(LTE)网络、码分多址(CDMA)、宽带码分多址(WCDMA)、无线保真(WiFi)、无线局域网(WLAN)、蓝牙网际协议数据传送、卫星、移动自组织网络(MANET)等等或者任意其组合。 Further, the wireless network may be, for example, a cellular network, and may use a variety of techniques, including enhanced data rates for global evolution (EDGE), General Packet Radio Service (GPRS), Global System for Mobile (GSM), IP multimedia subsystem QMS ), universal mobile Telecommunications system (UMTS), etc., and any other suitable wireless medium, such as a global interoperability for microwave access (WiMAX), long Term Evolution (LTE) networks, code division multiple access (CDMA), wideband code division multiple access (WCDMA), wireless fidelity (WiFi), wireless local area network (WLAN), Bluetooth internet protocol data transmission, satellite, mobile ad-hoc network (the MANET) and the like, or any combination thereof. UElOla为任意类型的移动终端、固定终端或者便携式终端，包括:移动手机、站点、 单元、设备、多媒体计算机、多媒体平板电脑、互联网节点、通信器、桌面电脑、膝上型电脑、 笔记本型电脑、网络书型电脑、平板电脑、个人数字助理(PDA)、音频/视频播放器、数字照相机/摄录像机、定位设备、电视接收器、无线广播接收器、电子书设备、游戏设备或者其任意组合，包括这些设备的附件和外围设备，或者其任意的组合。  UElOla be any type of mobile terminal, a fixed terminal or a portable terminal, comprising: a mobile handset, station, unit, device, multimedia computer, multimedia tablet, Internet nodes, communicators, desktop computers, laptops, notebooks computers, networking book computers, tablet computers, personal digital assistants (PDA), audio / video player, digital camera / camcorder, positioning device, television receiver, radio broadcast receiver, electronic book device, game device, or any combination of these devices comprising peripherals and accessories, or any combination thereof. 也可以设想的是，UElOla可以支持任意一种到用户的接口（例如“可佩带的”电路等）。 It is also conceivable that, UElOla can support any interface to the user (e.g., "wearable" circuitry, etc.). 作为一个例子，UElOla和位置资源服务应用相互通信，并与通信网络105中的其它组件相通信，其中上述通信使用公知、新或者还在研发中的协议。  As one example, communicate with each other and UElOla location service application resources, and communication with other components of the communication network 105, wherein the communication using well known, new or still developing protocols in. 在这种情形下，所述协议包括:定义了在通信网络105中的网络节点如何基于在通信链路上传输的信息进行相互交互的规则集合。 In this case, the protocol comprising: defining a network node in a communications network 105 how to interact with each set of rules based on the information transmitted over a communication link. 所述协议在各个节点中在不同的运行层上有效，例如从产生和接收各种类型的物理信号到选择用于传输这些信号的链路，到由这些信号标明的信息的格式，到识别运行在计算机系统中的哪个软件应用来发送或者接收信息。 The protocol is active in each node running on a different layer, for example, from the production and receive various types of signals to the selected physical link for transferring those signals, to the format of information indicated by those signals, to the identification run which software application in the computer system to send or receive information. 概念上用于在网络中交换信息的协议的不同层被描述在开放系统互连(OSI)参考模型中。 Different layers of protocols for exchanging information in the network is conceptually described in (OSI) Reference Model of Open Systems Interconnection. 在网络节点之间的通信通常被数据的离散分组的交换所影响。  Communications between the network nodes are typically effected by exchanging discrete packets of data. 各个分组通常包括：（1)与特定协议相关的头信息，和(2)负载信息，其在所述头信息之后，并包括可以与该特定协议独立地进行处理的信息。 Each packet typically comprises: (1) associated with a particular protocol header information, and (2) load information, which is after the header information, and includes information processing may be performed independently of that particular protocol. 在一些协议中，分组包括(3)包尾信息，其跟随在所述负载信息之后并指明了负载信息的结束。 In some protocols, the packet includes (3) packet trailer information following said load information and load information indicating the end. 包头包括例如分组来源的信息、目的地信息、负载的长度和其它由协议所使用的属性。 The packet header includes information such as origin, destination information, the length of the load, and other properties used by the protocol. 经常地，用于特定协议的负载信息中的数据包括用于与OSI参考模型中的不同的更高层相关联的不同协议的包头和负载信息。 Frequently, load information for a particular data protocol comprises the OSI Reference Model for different higher layer protocols associated with a different header and load information. 所述用于特定协议的包头通常标明用于在负载信息中包含的下一协议的类型。 The header for a particular protocol typically type for the next protocol contained in the load information designated for. 更高层协议是被封装在低层协议中的。 The higher layer protocol is encapsulated in the lower layer protocol. 包括在穿过多个异构网，例如因特网，的分组中的包头通常包括:如OSI参考模型中定义的物理(层1)包头，数据链路层(层2)包头、网络层(层3)包头和传输层(层4)包头和各种应用层(层5、层6、层7)包头。 In a heterogeneous network comprising a plurality of through, such as the Internet, typically in a packet header comprising: as physical (layer 1) OSI reference model defined in the header, the data link layer (layer 2) header, a network layer (layer 3 ) header and a transport layer (layer 4) header, and various application layer (layer 5, layer 6 and layer 7) header. 在一个实施例中，UElOla的位置资源服务应用107a和网络服务平台103a的位置资源服务应用107c可以依据客户端-服务器模式相互交互。  In one embodiment, UElOla resource location service applications and network services 107a internet resource location services application 107c 103a may be based on a client - server model interact with each other. 依据客户端-服务器模式，客户端进程发送包括请求的消息到服务器进程，服务器进程通过提供服务进行响应(例如提供地图消息）。 Based on a client - server model, a client process sends a message including a request to the server process, the server process responds (such as providing map information) through the provision of services. 服务器进程也可以返回一个带有响应的消息到客户端进程。 The server process may also return a message with a response to the client process. 经常地，客户端进程和服务器进程运行在不同的计算机设备（叫做主机）中，并且使用一个或者多个用于网络通信的协议通过网络进行通信。 Often the client process and server process running on a different computer device (called a host), and using one or more protocols for network communications to communicate over a network. 术语“服务器”通常用于指提供服务的进程，或者该进程运行其上的主机计算机。 The term "server" is generally used to refer to the process of providing services, or the processes running on its host computer. 相似地，术语“客户端”通常用于指进行请求的进程，或者该进程运行其上的主机计算机。 Similarly, the term "client" is generally used to refer to the requesting process, or the process which is running on the host computer. 如在此所使用的，术语“客户端”和“服务器”指的是进程，而不是主机计算机，除非另外地在上下文中清楚地说明。 As used herein, the terms "client" and "server" as used herein refers to a process, rather than the host computers, unless otherwise clear the context indicates. 此外，出于包括尤其是稳定性、可扩展性和冗余的原因，服务器执行的进程可以被分为运行多个进程在多个主机(有时候称为层)上。 Furthermore, for a particular including stability, scalability, and redundancy reasons, a process performed by a server may be divided into multiple processes running on multiple hosts (sometimes called tiers). 尽管出于揭示的目的，在图1中示出了一组特定的节点、进程和数据结构，但是在各种其它实施例中可以包括更多或更少节点、进程和数据结构。  While, for purposes disclosed, in FIG. 1 illustrates a particular set of nodes, processes and data structures, but in various other embodiments may include more or fewer nodes, processes and data structures. 进一步地，尽管出于揭示的目的，进程和数据结构被描述为在特定布置中的特定块，但是在其它实施例中各个进程或者数据结构或者其一部分可以被分开或者被组合或安置为一些其它的形式。 Further, although for the purposes disclosed, processes and data structures are described as a specific block in a specific arrangement, but various processes or data structures, or a portion thereof may be separated, or in other embodiments, be combined or arranged to some other form. 图2是根据一个实施例，图1中的系统100的概念图200。  FIG. 2 is a conceptual diagram according to one embodiment, the system 100 of FIG. 1 200. 在一个实施例中，系统100 部署有一个位置注册表201，其提供如下服务，该服务与基于永久位置ID服务205、位置元数据服务207和位置资源服务209等集成由提供方203 (例如资源拥有方）提交的位置数据相关，其中所述永久位置ID服务205为一个位置创建并匹配唯一的标识符（ID)，位置元数据服务207定位和保存与位置相关的标准化的核心元数据集。 In one embodiment, the deployment system 100 has a location registry 201, which provide the following services, the service ID of a service based on permanent location 205, location 207 and location service metadata 209 and other integrated services by a resource provider 203 (e.g., resources owner of the location data) related to submit, wherein said permanent location ID and match service 205 creates a unique identifier (ID) of a location, the location service metadata 207 positioned standardized core set of metadata and the storage location-related. 在其它的实施例中，两个或者多个这些服务被整合在一个单一的服务中，该单一的服务执行结合后的处理中的步骤。 In other embodiments, two or more of these services are integrated into a single service, the processing step performed after the binding of the single service. 提供方203可以为任意实体，其公布内容和/或使得资源通过位置注册表201而被获取到。  provider 203 may be any entity, which is a publication and / or resource registry 201 that is acquired by the position. 所述实体可以为个人、商业组织、非盈利机构、法人实体等。 The entity can be individuals, businesses, nonprofit organizations, and other legal entities. 所述提供方可以提供网络服务，该服务通过位置资源服务209公布网络资源。 The network provider may provide a service that resource by location service 209 published network resources. 位置注册表201为提供方提供网络资源目录以链接资源到它们自己的资源，该网络资源目录通过位置(例如在纽约城的市中心的披萨餐馆)列出与位置相关的网络资源。  location registry 201 provides network resource directory provider to link resources to their own resources, the network resource directory lists associated with the location of network resources by location (for example, a pizza restaurant in downtown New York City). 所述目录条目由提供方(例如资源拥有方)进行输入，而不是由志愿者互联网用户或者网络爬行应用输入。 The directory entry input by the provider (e.g. resource owner side), rather than the input application crawling volunteer Internet users or network. 在一个实施例中，位置注册表201与提供方203不使用用户界面而交换信息。 In one embodiment, the location registry 201 and the provider 203 does not use the user interface exchange information. 在另外的一个实施例中，位置注册表201向提供方203的管理者提供一个用户界面，以注册位置数据等。 In a further embodiment, the location registry 201 provides a user interface to a provider manager 203 to register the position data and the like. 位置注册表201不是一个目录搜索引擎(例如开源目录项目，谷歌目录@等），并且不为公众基于关键字显示网页列表。 Location registry 201 is not a directory search engine (such as an open source project directory, Google directory @, etc. ), and do not display the web page for the public based on a keyword list. 经位置进行的资源分类可以基于整个网站而不是一个网页或者一组关键字，所述网站经常被限制为仅包含少数的一些位置。  resource classification by location can be based on the entire site, rather than a web page or a set of keywords, the website is often restricted to include only a small number of some positions. 所述位置资源目录使得提供方可以直接注册它们的资源以包括一个或者多个位置，系统100出于适合性而审阅所述递交的信息。 Such that the locations of the resource directory providers may register their resources directly to include one or more locations, and suitability for the system 100 to review the submitted information. 位置注册表201包括已知的位置和可选的位置内容的集合。  The location registry 201 comprises a known location and an optional set of location content. 对于提供方来说已知的位置为:提供方至少知道(例如实体的数据库具有它)该位置的位置ID (例如通常指定的位置ID)和可选地提供方的用于所述位置的私人标识符，和任意与所述位置相关联的服务、 产品等的对应内容。 For the provider is aware of the location of: providing at least party knows (e.g. has its database entity) Location ID (e.g., generally designated location ID), and optionally the location for the private party location identifier, and any associated with the location service, or the like corresponding to the content of the product. 通过使得提供方公布其私人的用于一个位置的标识符，位置注册表201 可以在其和也维持有位置信息（例如WhereOnEarth(D)其它引用系统之间提供交叉引用映射。 By such providers publish their personal identifier for a location, the location registry 201 can be maintained and its position information (e.g. WhereOnEarth (D) to provide cross-reference mapping between other reference systems. 当提供方发送一个注册消息以注册一个位置在位置注册表201中时，所述消息应该包括足够的信息(例如位置的名字、位置的元数据等）以确定与在元数据数据结构中的预定位置的匹配的程度。  When the provider sends a registration message to a registration position at the location registry 201, the message should include sufficient information (e.g., location name, meta-data location, etc.) to determine the data structure in the metadata matching degree in a predetermined position. 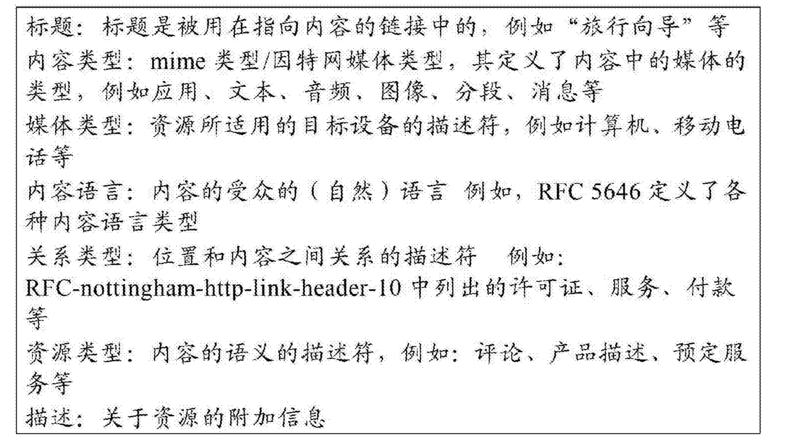 所述位置注册消息可以是一个在HTTP POST消息的主体中的XML文件。 The location registration message may be an XML file in the body of HTTP POST message. 通过提供方的协作努力，位置注册表201保持了一组已知位置为最新的。  collaborative effort by the provider, location registry 201 maintains a set of known position to date. 越多的提供方声称知道一个位置，这样位置越可能真实存在并越可能所有的提供方同意的数据是正确的。 The more providers claim to know a place, the more likely this position is real and more likely to agree to provide all the data is correct. 同时，越多的提供方从已知位置的列表中删除一个位置，越可能这个位置不再存在(例如搬到了不同的地点、改变了所有权、重新命名、因原因而关闭、永久地关闭等）。 At the same time, more and more providers to delete a location from the list of known location, the more likely this position no longer exists (for example, moved to a different location, change of ownership, rename, reasons and closed, permanently closed, etc.) . 基于一组称为基本属性(例如名字、地址和分类）的位置相关属性，通过为各个已知的位置设置一个标识符，永久的位置ID服务(PPIDS) 205为每一个在地球上的位置提供标识。  Based on a set of basic properties referred to (such as name, address and classification) related to the position property, by a respective known location identifier is provided, the permanent ID of the location services (PPIDS) 205 for each on earth the location provides identification. 提供方发送一个位置注册消息（例如以HTTP的方式）到位置注册表201以注册一个新位置。 Provider sends a location registration message (e.g. in a manner HTTP) to a location registry 201 to register a new location. PPIDS205基于例如一个目标映射源，例如NAVTEQ®的商业位置参考对象(LRO)数字地图服务，来确定位置注册消息是否是合法的。  PPIDS205 based on a target such as mapping source, such as a business location NAVTEQ® reference object (LRO) digital mapping service to determine whether the location registration message is legitimate. 作为一个例子，所述LRO服务指明了是否一个指定的街道名称存在于一个给定的城市中或者在一个给定的邮政编码中，或者对于给定的街道名称是否存在一个给定的房屋号码。 As an example, the LRO service indicates whether a specific street name exists in a given city or in a given ZIP code, or in a given house numbers for a given street name exists. 在其它的实施例中，PPIDS205也确定和校正位置注册元数据，例如针对那些错误的拼写、颠倒的数字、丢失的邮编或城市，而产生合法的正确的位置注册元数据。 In other embodiments, PPIDS205 also determine and correct the position registration metadata, such as those for spelling errors, inverted digital, lost zip code or city, and produce legally correct location registration metadata. PPIDS205通过使用匹配逻辑以比较位置的元数据属性以及合并指向相同位置的位置ID，来避免创建重复的位置（即为相同的物理位置创建多个位置ID) JPIDS205检查位置元数据的合法性并当新位置资源的位置元数据与已经存在的位置资源的位置元数据很近地匹配时，通过识别处理来避免重复。  PPIDS205 by using matching logic to compare the location of the metadata attribute ID and combining the same position pointed position, a position to avoid creating duplicate (i.e. the same physical location to create a plurality of positions ID) JPIDS205 inspection position metadata legitimate and when the position of meta-data location metadata location of resources already existing resources of the new location close to matching, by identifying process to avoid repetition. 作为一个例子，PPIDS205实施模糊逻辑匹配算法， 其在即使已知位置的元数据不是完全匹配位置注册的元数据时也对位置匹配。 As one example, PPIDS205 embodiments fuzzy logic matching algorithm, which even if the metadata is not perfectly match a known location also match the position registered meta-data location. 所述模糊逻辑匹配算法可以包含不同的组件，该组件包括有地点识别、分类定义、名字解析、邻近检测以及在先选择跟踪的功能，如在美国专利申请第12/478,484中所揭示的，上述美国专利申请的完整内容通过引用被结合于此。 The fuzzy logic matching algorithm may comprise different assembly comprises location identification, classification definitions, name resolution, proximity detection and tracking functions previously selected, as described in U.S. Patent Application No. 12 / 478,484 disclosed the complete US patent applications are incorporated herein by reference. 因此，PPIDS205实施一些邻近搜索以检查与位于接近所提供的地址或地理定位坐标的位置的匹配。 Thus, PPIDS205 embodiment searches the address matching or some neighboring geographical positioning and located near the inspection provided by the position coordinates. PPIDS205接着计算“匹配质量”值或者匹配程度值，其给出了一种关于各个返回位置的数据与来自提供方的注册元数据的靠近程度。 PPIDS205 then calculates "quality of match 'value or values ​​of the degree of matching, which gives data on a respective return position and from the proximity of the registration of the metadata provider. PPIDS205返回数据，其标识了一个或者多个候选位置列表，这些候选位置显示匹配程度值高于预定的门限。 PPIDS205 return data that identifies one or more candidate location list, the display position of candidate matching degree higher than a predetermined threshold value. 此后，提供方接收到候选位置列表。  Thereafter, the provider receives the candidate location list. 如果提供方不同意任何一个候选位置，提供方就不得不手动地修正元数据并返回带有新元数据的注册。 If the provider does not agree with any candidate for a position, the provider would have to manually correct metadata and returns a registration with the new metadata. 否则，提供方选择候选位置中的一个，并将所选择的位置在一个消息中发送回注册表201。  Otherwise, a provider selected candidate position, and the selected location in a message sent back to the registry 201. 基于所选择的候选位置，PPIDS205根据每种位置资源类型的标准化的位置元数据格式从注册元数据构建候选元数据。 Based on the selected candidate position, PPIDS205 construct the candidate metadata from the metadata registered in accordance with the standardized location of the resource for each type of location metadata format. PPIDS205在一个更新位置消息中发送位置注册元数据到位置元数据服务(PMDS) 207，以基于位置注册元数据更新被选择位置的元数据。 PPIDS205 transmits a location registration metadata message into a location update location metadata service (PMDS) 207, based on the location registration update metadata is metadata selected position. PMDS207 更新被选择的位置，并在一个消息中发送被更新但是还存在的位置的位置ID。 PMDS207 update location is selected, and transmits the updated location ID but also exists in a location message. 如果作为一个更新结果原始的部分匹配位置与其它位置相合并，则所述位置ID可能就改变了。 If, as a result of updating the original position matching part merged with the other positions, then the location ID may be changed. PPIDS205在一个消息中返回所述现存位置的位置ID。 PPIDS205 return position ID of the existing position of the one message. 基于被选择的候选位置，PPIDS205也学习哪一个元数据被用于识别一个位置并自动地创建一些附加的匹配度量和/或试探以评算出被选择的候选位置和其它候选位置之间的差别。  Based on the selected candidate position, PPIDS205 also learn which metadata is used to identify a location number and automatically creates the matching metric between the additional and / or heuristics to assessment calculates the position of the selected candidate and the other candidate positions difference. 在一个实施例中，这些度量可以适用于相同提供方将来的位置注册尝试中，或者适用于其它提供方将来的位置注册尝试中。 In one embodiment, these metrics may be applied to the same location registration attempt provider in the future, the future location or other suitable provider registration attempt. PPIDS205使得可以注册位置并返回所述位置的标识符。 PPIDS205 such identifier may be registered position and back to said position. PPIDS205建立位置注册表201的基础。  PPIDS205 basis for the establishment of the position of the registry 201. 其提供一个唯一标识符给各个由用户提供(注册）的位置。 Which provides a unique identifier provided to each user (registered) position. 在注册的过程中，PPIDS205验证、标准化、改进所提供的属性并相对于原先注册的位置复制这些属性。 In the registration process, PPIDS205 verification, standardization, improved replication properties provided and these properties relative to the original registration. 知道了位置的唯一标识符使得各个用户可以查看所有针对该位置而公布的URI，不用例如进一步地指示出位置的特征(例如地点、类型等）。 Unique identifier known position so that each user can view all URI for that position and released, for example, without further indicates characteristics (e.g., location, type, etc.) position. 所述URI可以被用于建立与所述位置相关的信息的混搭。 The URI may be used to establish mashup information related to the location. 位置元数据服务(PMDS) 207使得可以通过位置的唯一标识符而查看和维护位置的基本属性。  The location metadata service (PMDS) 207 may view such basic properties and maintain the position of the position by the unique identifier. 在一个实施例中，PMDS207遵循维基的方式，使得多个提供方协助保持位置的状态和基本属性是最新的。 In one embodiment, PMDS207 followed the wiki manner, such that a plurality of providers assist in maintaining the position and status of the latest basic properties. PMDS207绑定网络资源（如URL那样）到一个位置。 PMDS207 bind network resources (such as URL) to a location. 一个全球位置名字服务(GPNS)可以被包括在PMDS207中以注册一个全球都是唯一的名字，其被称作位置ID， 用于一个位置。 A global name service position (GPNS) may be included in PMDS207 to register a global name is unique, which is known as the location ID, for a position. 在另外的一个实施例中，GPNS的功能被包含在PPIDS205中。 In a further embodiment, GPNS functions are included in the PPIDS205. 一个提供方可以发送给PMDS207—个消息（例如HTTP的Get消息）以请求一个位置资源。 Provider may send a message to PMDS207- (e.g. an HTTP Get message) to request a resource location. 这个请求至少包括一个位置ID。 This request comprises at least one location ID. 另外，提供方可以通过PMDS207读取和管理所述位置的元数据。 Further, the provider can read and manage metadata of the location by PMDS207. [ΟΟόΟ] 作为一个例子，一个位置元数据项包括位置ID域、位置URL域、合并后的位置ID域、 位置类别域(例如酒吧、餐馆等）、位置名字域、位置地点域和位置联系方式域等。 [ΟΟόΟ] As an example, a location metadata item includes a location ID field, the position of the URL field, the position of the combined ID field, location type field (such as bars, restaurants, etc. ), the location name field, the position location field and the position of contact domain and so on. 这些域可以与其它额外域结合以不同的顺序而被设置。 These domains may be combined with other additional fields in a different order are provided. 所述位置ID域具有数据(例如URD，其指示了特定位置的唯一标识符。所述位置URL域具有数据，其标明了在网络上的主要位置资源(例如由提供方所持有网页，所述提供方注册了位置并使用位置ID进行了命名），用于获取与位置相关的信息和/产品/服务等。到与位置相关的多个其它资源(如果有的话）的链接，可以在主要的位置资源中被发现。一个位置可以通过任意曾经被分配给这个位置的ID而被访问。提供方可以自由地通过标记分配它们自己的分类给一个位置。这些分类可以包括行政区域、地点、交通网络、建筑、地标、政府设施、交通设施、宗教设施、体育设施、教育设施、艺术和娱乐、健康保健、住宿、就餐、外出、贸易和修补、批发、建造、金融、法律、个人服务、商业服务、通信和媒体、旅行服务、不动产、出租等。 ID field having the position data (e.g. the URD, which indicates the unique identifier for a particular position. The position of the URL field has data, which indicate the position of the primary resource on the network (e.g., web page held by a provider, the said provider registered with the location and use of location ID is named), used to obtain location-related information and / products / services, etc. to a number of other resources associated with the location (if any) of the link, you can was found that the main location of resources. a position can ever be assigned by any given ID of this position is accessed. providers are free to assign their own classification to a position by the mark. these categories may include administrative areas, locations, transportation networks, buildings, landmarks, government facilities, transportation facilities, religious facilities, sports facilities, educational facilities, arts and entertainment, health care, accommodation, meals, meals, trade and repair, wholesale, construction, financial, legal, personal services, business services, communications and media, travel services, real estate, rent and so on. 在一些实施例中，一个单一位置的位置资源被作为一个或者多个网络资源而提供，例如作为一个或者多个文件或者目录或者网页，其是通过对应的统一资源标识符(URI) 而被访问的，的集合而提供。  In some embodiments, the resource location is a single location as one or more network resources provided, e.g., as one or more files or directories or web page, which is obtained by a corresponding uniform resource identifier (URI) while being accessed, the set is provided. 在网络中的域名服务器(DNS)解析URL名字为网际协议（IP)地址，该地址被用于路由那些在IP网络间发送的消息，这些是公知的现有技术。 In the network Domain Name Server (DNS) to resolve the URL name of an Internet Protocol (IP) address, the address is used to route those messages sent between the IP networks, which are well known in the prior art. 因此，一旦被给予了URI，网络浏览器的用户就可以访问这些位置资源。 Therefore, once it is given URI, web browser users can access the location of the resource. 在一些实施例中，位置资源不是单独地从一个位置元数据的中心数据库而维护的。 In some embodiments, the location of the resource is not a separate location from a central database maintained by the metadata. 通过PMDS207,提供方可以获取到与位置ID相关的元数据，或者发现一个位置的位置ID，其中该位置带有的元数据是完全地或者部分地与现有的元数据相匹配的。  By PMDS207, provider may obtain the metadata associated with the location ID, location ID or find a position, wherein the metadata with the position are completely or partially with the existing metadata that matches . 根据一些实施例，由PMDS207所执行的过程被PPIDS205所使用来对注册在位置注册表201中的元数据进行质量控制，并实质性地减少重复的项。 According to some embodiments, the process to be executed PMDS207 quality control of the position registration metadata 201 in the registry to be used PPIDS205, and to substantially reduce duplicate entries. 为防止恶意地创建新项，仅从被信任的来源，例如PPIDS205,处来的创建新位置或者更新条目的消息被接受。 Create a new item in order to prevent malicious, only from trusted sources, such as creating a new location or update information entry is accepted PPIDS205, at come. 位置资源服务(PRS) 209使得可以查看和维护位置相关资源的目录。  Location Resource Service (PRS) 209 makes it possible to view and maintain the directory location of related resources. 相一致地，这些服务提供了基于地点的信息的协作管理。 Consistently, these services provide collaborative management of location-based information. PRS209使得提供方203可以公布它们自己的与位置相关的网络资源。 PRS209 allows providers 203 can publish their own location-related network resources. 在这种情形下，一个资源可以是任何一种信息，其可以通过URI而被引用。 In this case, a resource may be any information that can be referenced by a URI. PRS209使得提供方203通过和URI—起公布其它的元数据，进行它们的网络资源的描述。 PRS209 released so that other providers 203 and the metadata by starting URI-, describe their network resources. 对于每一个提供方，PRS209隐含地创建“默认操作/服务”，其同样被命名为提供方。  For each provider, PRS209 implicitly create a "default action / service", which is also named provider. 如所述的，提供方通过一个客户端应用在PRS209中公布内容。 As described, by a provider client application in a publication in PRS209. 作为一个例子，要被公开的内容可以是任意的带有URI的网络资源。 As one example, the content to be disclosed may be any network resource with a URI. PRS209使得可以在提供方的商业环境中公布内容。 PRS209 makes it possible to publish the content provider's business environment. 在提供方和连接提供方到PRS209的客户端应用之间可能存在1:1或者n: 1的关系。 There may be between 1 to PRS209 provider in connection provider and client application: Relationship 1: 1 or n. 在提供方和在PRS209中公布其网络资源的提供方运行的商业活动之间可能存在1:1或者I :η的关系。 1 may exist between the commercial activity providers and publish their network resources in PRS209 the provider run: 1 or I: η relationship. 因为提供方可能在同一个时间运行多个操作(包括非盈利的操作)和/或商业活动(例如包括不同的产品和/或服务等），所以提供方也可能公布用于不同操作和/或商业活动的内容到注册表201中。 Because providers may run multiple operating (including non-profit operation) and / or business activities (including, for example different products and / or services, etc.) at the same time, so the provider may also be released for different operating and / or content business to the registry 201. 对于各个操作/商业活动，PRS209提供一些对这些操作和/或商业活动是已知的位置。 For each operation / business, PRS209 some of these operations and / or the position of business activities are known. 对于各个产品/服务，PRS209可以提供一些精确的对于这些操作和/或商业活动是已知的位置。 For each product / service, PRS209 can provide some accurate for these operations and / or business activities are known location. 提供方可以手动地管理一个或者多个这些位置。 Provider can manually manage one or more of these positions. 位置注册表201的其它组件也可以隐含地修改一个或者多个这样的位置。 Other location registry assembly 201 may implicitly modify one or more of such positions. 例如，不论何时提供方注册一个位置到位置注册表201中，系统100确保该位置被列出在一个或者多个提供方的默认操作/商业活动的已知位置中。 For example, whenever a location registration to the provider location in the registry 201, the system 100 to ensure that this position is a position in a list known or more default operations / business provider's. 对于每一个操作/商业活动的已知位置，对应的提供方可以公布和管理任意数量的内容项。 For each operation / known location of business activities, the corresponding provider can publish and manage any number of content items. 除了各个内容项的URI，提供方也可以公布一些元数据以描述内容项。 In addition to URI individual content items, providers can publish metadata to describe the content of some items. 连接到PRS209的客户端应用可以访问PRS209,以读取由提供方针对一个指定位置公布的所有内容项中的一个或者多个。 PRS209 connected to the client application can access PRS209, to read one or more content items provided by all approach to a designated location published in the. 图3是依据一个实施例，位置资源服务应用的组件的图示300。  FIG. 3 is accordance with one embodiment, the illustrated location of the resource module 300 of the service application. 作为一个例子，网络服务平台l〇3a的位置资源服务应用107c包括一个或者多个组件，其用于通过协作注册表在实体间聚集和链接位置数据。 As one example, network resource location service platform l〇3a service application 107c includes one or more components, and for gathering data link position by cooperation between entities registry. 可以设想的是这些组件的功能可以被整合在一个或者多个组件中或者由等同功能的其它组件所执行。 It is contemplated that the functions of these components may be integrated in one or more components or performed by other components of equivalent function. 在这个实施例中，位置资源服务应用l〇7c至少包括一个控制逻辑301，其执行至少一个算法用于执行位置资源服务应用107c的功能。 In this embodiment, the resource location service application includes at least a l〇7c control logic 301, which performs an algorithm for performing at least one resource location service application function 107c. 例如， 控制逻辑301与位置数据管理模块303相交互以增加一个已知的位置到位置注册表201中和/或从位置注册表201中的已知位置集合中删除已知位置。 For example, the control logic 301 and the position data management module 303 interacts to add to a known position in the location registry 201 and / or deleted from a known location in a set location in the registry 201 at known locations. 存在至少三种机制用于增加一个位置到已知位置集合中。  There are at least three mechanisms for increasing a collection location to a known location. 在一个实施例中，当提供方注册位置时，位置数据管理模块303通过PPIDS205自动增加位置到提供方的默认操作/ 商业活动中。 In one embodiment, when the provider registration position, the position data management module 303 automatically increased by PPIDS205 position to the provider default action / business activities. 在另一实施例中，当提供方修改位置时，位置数据管理模块303自动地通过位置元数据服务207增加位置到提供方的默认操作/商业活动中。 In another embodiment, when the provider to modify the location, the position data management module 303 automatically increases the service 207 to the default position of the operation / business provider by location metadata. 还在另一个实施例中，所述提供方手动地增加位置。 In yet another embodiment, the provider manually position increases. 当所述提供方通过一些其它渠道接收其位置时，可以使用手动增加。 When the provider receives its position by some other channels, you may be used to manually increase. 当所述提供方要公布其用于各个自动创建的已知位置的私有标识符时，也可以使用所述手动增加，因为两个自动增加机制不能够推断出用于一个位置的操作/商业活动的私有标识符。 When the provider to publish the private identifier for each known position automatically created, using the manual may be increased, because the two mechanisms are not able to automatically increase operable to infer a location / business the private identifier. 在另一个实施例中，私有位置ID被直接地加入到PPIDS注册请求中以将所述私有ID 和注册表201中的已知位置相关联。 In another embodiment, the position of the private ID directly added to PPIDS registration request to the private ID and the registry 201 associated with a known position. 在另外的一个实施例中，在自动增加机制仅运行在一个默认的操作/商业活动的情形下，在提供方维护多个在资源注册表201中的操作/商业活动时，可以使用手动增加。 In a further embodiment, in the case where the automatic mechanism of increasing only run a default operation / commercial activities, maintenance provider in a plurality of operations / business activities in the resource registry 201, may be used to manually increase. 位置数据管理模块303也从一个操作/商业活动的已知位置中删除单个位置。  The position data management module 303 from a single location delete operations / business activities of known location. 在一个实施例中，可以通过插入或者公布语义上的“这个操作/商业活动就该位置不再具有知识/内容”，来执行从已知位置集合中删除一个位置。 In one embodiment, it is possible "not having knowledge of its location / operation of this / commercial activities" published by insertion or semantic, to delete a set position from a known location. 这种操作不同于元数据服务207的操作“标识一个位置为已删除”。 This operation is different from the metadata service operation 207 "identifies a position as deleted." 所述的“标识一个位置为已删除”表明提供方知道该位置不再存在。 The "identifies a position as deleted" indicates that the provider knows the position no longer exists. 在另一个实施例中，删除一个已知位置会触发删除掉所有的对针对所述操作/商业活动而在位置资源服务209中公开的内容的引用。  In another embodiment, remove a known location triggers deleted all references to content and resources at the service location 209 disclosed for the operating / business activities. 还在另一个实施例中，当提供方从其默认的操作/商业活动中删除一个位置时，所述位置被从相同提供方的所有其他操作/商业活动中删除。 In yet another embodiment, when the position of a provider to delete from its default operations / business, the position to be deleted from all the other operations / business activities in the same provider. 从提供方的任意其它商业活动的已知位置的集合中删除一个位置，对其他操作/ 商业活动没有负面影响。 To delete a location from the collection known location of any provider of other commercial activities, there is no negative impact on other operations / business activities. 位置数据管理模块303也为提供方实施对于已知位置的大批维护。  The position data management module 303 maintains a large number of the known embodiment is the location provider. 在一个范例使用例子中，基于最新的Lonely Planet®的所有位置集合的转储/备份，实施位置数据集成， 其中所述Lonely Planet®公布旅行向导书和数字媒体。 In one example use case, dump / backup set of location based on all the latest Lonely Planet®, the implementation of data integration position, wherein the travel guide Lonely Planet® published books and digital media. 例如，所述公司为旅行者提供了网站、博客、社交网络内容、评论、旅行计划工具、旅行贴士和建议等。 For example, the company offers travelers a website, blog, social networking, comments, travel planning tools, travel tips and advice. 对于各个国家、地区、城市或者关注点，旅行向导需要更新其内容，该内容包括何时去、去哪里、成本和金钱、历史、 艺术、建筑、环境和计划、政府和政治、媒体、因特网资源、邻居、食物和餐馆、娱乐（舞蹈、戏剧、酒吧等）、体育和活动、旅店和住所、远足、交通等。 For each country, region, city or concerns, tour guide needs to update its content, which includes when to go, where to go, and the cost of money, history, art, architecture, environment and planning, government and politics, the media, Internet resources , neighbors, food and restaurants, entertainment (dance, theater, bars, etc. ), sports and activities, hotels and accommodation, excursions, transportation and so on. 在一个实施例中，旅行网站内容管理系统被直接地连接到和/或集成到位置注册表201。  In one embodiment, the travel website content management system is directly connected to and / or integrated into a location registry 201. 无论何时网站内容管理系统创建一个新的位置，位置数据管理模块303自动地向永久的位置ID服务205注册新的位置。 Whenever a web content management system to create a new position, the position data management module 303 service automatically registered 205 new permanent location to location ID. 此外，不论何时网站内容管理系统通过标记位置为不存在或者通过从公司的已知位置的集合中删除位置来删除一个位置，位置数据管理模块303 都会发送更新到位置元数据服务207。 In addition, whenever a web content management system by marking the position does not exist or to delete a location removed from the collection by the company's position in a known location, the location data management module 303 will send an update to the service location metadata 207. 在另一实施例中，提供方的纸质公布内容存档可能不具有完整的用于位置注册表201的资源元数据集合。 Paper published SUMMARY  In another embodiment, the provider may not have a complete archive location registry for resource metadata 201 is set. 例如，其位置转储/备份不包含任何位置ID，也不包含在两个转储之间位置的任何状态信息(例如，“新的”、“更新的”、“未碰过的”），和/或没有提供关于在前一次转储后被删除的位置的信息。 For example, the position of the dump / backup does not contain any location ID, status information does not contain any position between two dump (e.g., "new", "update" and "non-touched"), and / or did not provide information about the position after the previous dump deleted. 位置注册表201还可以支持对于纸质公布内容存档的已知位置集合的管理。 Location registry 201 can also support the management of a known position paper published contents of an archive collection. 在纸质公布的情形下，位置数据管理模块303提供一种简单机制用于标识所述存档中的已知位置，并用于定义对位置进行标记/取消标记的操作，并用于使得可以从在所述存档中的已知位置的集合中删除所有被标记的位置。  In the case of a paper published by the position data management module 303 provides a simple mechanism for identifying the known locations in an archive, and used to define the location marked / labeled cancel operation, and makes it possible for remove all positions from a set of labeled in a known position in the archive. 在一个例子中，大量位置维护如下述地被实施。 In one example, a large number of positions are maintained as follows the embodiment. 在处理新位置转储之前，公司创建一个新的标记，将其标记在所述存档中的已知位置的集合中的各个位置上。 Before the new process dump position, the company to create a new tag, which marks the set position of the archive known in various locations. 所述公司接着简单地通过永久位置ID服务205,相对于ID再次注册所有包含在最近转储中的位置，和/或通过位置元数据服务207更新位置的属性。 The company then simply by permanent location service ID 205, ID re-registration with respect to all positions is included in the most recent dump, and / or by the location service 207 updates the metadata property or location. 对于所有的注册的/修改的位置，永久位置ID服务205和位置元数据服务207将在公司的所有操作/商业活动中的已知位置的所有位置中，隐含地删除所有的标记。 For all registered / modified position, permanent location ID and location services 205 207 all metadata service position known locations in all the company's operations / business activities in, implicitly remove all marks. 一旦在所述转储中的所有的位置被处理了，仅这些还被标记的位置是那些不再包含在最近转储中的位置。 Once all the positions of the dump been processed, only those marked position is also a position that no longer contained in the most recent dump. 公司接着可以以一个单一操作从已知位置的集合中删除所有的还被标记的位置。 The company may then delete all of the positions is further set of markers from a known location to a single operation. 控制逻辑301也与公布模块305相交互以支持提供方公布在内容与其相关的位置的环境下内容。  The control logic 301 also interacts announcement module 305 to support the content providers of publication content associated with the location environment. 内容可以是任意可以通过统一资源标识符(URI)而被引用的信息。 The content may be any information can be referenced by Uniform Resource Identifier (URI). 提供方公布内容以邀请其他的提供方来链接到所述提供方的商业活动/网站中。 Provider publish content to invite other providers to link to the provider's business / website. 提供方也与URI—起公布资源元数据以使得连接到位置资源服务209的另一提供方的另一客户端应用决定是否连接到所述的内容。 Providers also released from URI- resource metadata 209 to be connected to such a position other resource service provider client application further determines whether the connection to the content. 资源元数据可以包括定义在表1中的属性。 Resource metadata may include attributes defined in Table 1. 控制逻辑301也与内容处理模块307交互以表示如表1中所定义的内容项的集合， 例如像在表2中所详细说明的Atom提要，其用于向用户提供如用户所订阅的通过注册表201 聚合/聚集的内容。  Control logic 301 may also interact with the content processing module 307 to represent the set of content items as defined in Table 1, such as for example in Table 2. Atom feed explained in detail, as provided to the user for user subscriptions registry 201 by polymerization aggregation content /. 在一个实施例中，建立的ATOM提要格式被再使用来公布所有的对于一个位置是已知的资源。 In one embodiment, the establishment of the ATOM feed format to publish all be reused for a resource location is known. 作为一个例子，Atom是基于XML的文本格式，其描述了称为“提要”的相关信息的列表。  As an example, Atom is an XML-based text format, which describes the list as "summary" of the relevant information. ATOM提要包括两个相关的标准。 ATOM feed, including two related standards. Atom聚合格式是用于网络提要的XML语言，并且Atom公布协议(AtomPub)是简单的基于HTTP的协议，用于创建和更新网络资源。 Atom syndication format is an XML language used for web feeds and the Atom publishing protocol (AtomPub) is a simple HTTP-based protocol for creating and updating web resources. 提要包括有一些项，称为“条目”，每一个项带有附加元数据的可扩展集合。 There are some items including feed, known as the "entry", a term with each additional set of metadata can be extended. 在一个实施例中，对于在服务的已知位置集合中的各个项，注册表201提供一个Atom提要用于由提供方运行的网络服务。  In one embodiment, for each entry in the known position of the set of services, registry 201 provides a network service for Atom feed operation by the provider. 该网络服务利用其自己的Atom提要，可以通过运行在提供方自己的服务器中的客户端应用来管理其内容。 The network services using its own Atom feed, you can manage their content provider by running your own server in a client application. 使用已经订阅的其它网络服务的Atom提要，提供方的网络服务可以检查已经公布在注册表201中的其它网络服务的更新。 Other network services have been subscribed to the Atom feed, the network service provider can check for updates other network services in the registry 201 have been published. 在一个实施例中，各个项具有如表2所示的标题、内容类型、媒体类型、内容语言、关系类型、资源类型、描述。 In one embodiment, each entry has a header as shown in Table 2, the content type, media type, content language, relationship types, resource types, is described. 在另一个实施例中，一个项包含大标题、全文、摘录、概要、指向网站上内容的链接、各种元数据或者其组合。 In another embodiment, the item contains a title, text, extract, summary, a link pointing to the content on the website, various metadata or combinations thereof. 当被指令时，客户端应用询问在其提要列表中的全部或者部分的服务器是否这些服务器有新的内容，如果有的话，所述客户端应用要么对新的内容做个记录要么下载该新的内容。  When the instruction, the client application interrogates its list feed all or part of the server whether the new content servers, if any, of the client application or a new content to be recorded either download the new content. 注册表201周期性地对所述客户端应用检测新内容。 Registry 201 periodically detects the new client application content. Atom提要是推送技术（即客户端推送，其中起初的数据请求是来源于客户端的，接着注册表201进行响应)的一个例子，尽管它们可能呈现为从注册表201到由提供方203所运行的网络服务的内容推送。 Push technology is Atom feed (i.e., a push client, wherein the data request from the first client 201 then responds to the registry) is an example, although they may appear to run from the registry 201 to the provider 203 content network services push. 在另一个实施例中，内容处理模块307也为服务/商业活动的已知位置集合中的各个项提供Atom提要，其中所述服务可以通过ATOM-PUB协议管理其内容。  In another embodiment, the content processing module 307 also provides entry for each service Atom feed / collection of known positions in commercial activities, wherein the service can manage the contents of which ATOM-PUB protocol. 所述的Atom公布协议(AtomPub)是一个应用级别协议，用于公布和编辑网络资源。 The Atom publishing protocol (AtomPub) is an application-level protocol for publishing and editing web resources. 该协议基于Atom格式化表示的HTTP传输。 The HTTP protocol is based on the transmission format represented by Atom. 所述的Atom公布协议仅涵盖创建、编辑、删除项和媒体资源。 The Atom publishing protocol covers only create, edit, delete entries, and media resources. Atom格式在atom 聚合格式下记录。 Atom format recorded atom syndication format. 内容处理模块30 7也提供机制实施隐含内容公布。  Content processing module 307 also provides mechanisms for implicit announce embodiment. 对于在其已知位置集合中的所有位置(例如餐馆)具有相同类型的内容的商业活动/服务可以使用位置资源服务209的隐含内容公布特征。 Commercial activities for all locations (such as restaurants) in its known position in the collection have the same type of content / services can use the resource 209 location service announcement features hidden content. 所述服务提供其资源的元数据属性以及URL模板（例如michelinguide · com/newyork/restaruant/YYY)。 The service provides its resource properties and metadata URL template (eg michelinguide · com / newyork / restaruant / YYY). 这个URL模板可以包含用于位置ID和/或商务活动标识符的变量，当内容项目被公布在位置的聚集内容的提要中时，所述变量被位置资源服务209自动地替换为位置的特定值。 The URL template can contain variables for location ID and / or business identifiers, when the content item is published in synopsis aggregation of content location, the variables are automatically replaced with 209 service locations of the resource value for the location-specific . 内容处理模块307也提供一个机制，其使得提供方的客户端应用访问内容项。  The content processing module 307 also provides a mechanism that enables client applications to access the content item provider. 对于每一个对于位置注册表201是已知的位置，位置资源服务209提供一个Atom提要，其中连接到PRS209的客户端应用可以访问用于所述位置的从所有操作/商业活动中聚集的所有内容。 For each position for a registry 201 is a known location, location service resource 209 provides an Atom feed, which is connected to PRS209 client applications can access all of the content from the position aggregated all operations / business activities . 所述提要提供各种语言和内容协商特征，以过滤出适用于特定用处的内容。 The feed provides a variety of languages ​​and content negotiation feature to filter out the content for a particular use. 内容处理模块307进一步提供一个机制，其使得提供方控制访问范围/级别，该访问范围/级别使得其他的连接到位置资源服务209的客户端应用可以看见它们所公布的资源，即订阅一类Atom提要。  Content processing module 307 further provides a mechanism which enables the provider to control access range / level, the extent of access / levels such that other connections to 209 positions resource service client application may see the resources they are released, i.e. Subscription a class Atom feed. 系统100被建立为一个协作平台，以便位置资源服务209可完整地访问所有的由提供方递交的内容项。 100 system is established as a collaborative platform for resource location service 209 may complete access to all content items submitted by the provider. 然而，出于商业原因（例如商业秘密、契约关系、客户列表、竞争优势等)或者非商业原因（国家安全、政治拥护、奖学金竞争等），每个提供方被使得可以针对其它的提供方(例如客户端、伙伴、竞争者等)设置其自己的访问策略。 However, for commercial reasons (such as trade secrets, contractual relationships, customer lists, competitive advantage, etc.) or non-commercial reasons (national security, political advocacy, scholarship competition, etc. ), each provider is making it possible for other providers ( For example clients, partners, competitors etc.) set their own access policies. 具有限制访问的能力使得提供方可以使用位置资源服务209以用于公开的公布和内容聚合。 Such that the ability to restrict access providers may use location service resource 209 for the disclosed disclosure and content aggregation. 在另一方面，仅对于基本数据库不是其他的提供方，一些存在的基本数据库设置了对于公布内容的“私有的”和“公开的”访问。 On the other hand, not only for basic database other providers, there is some basic database set up "private" and "public" access to published content. 内容处理模块307也提供一个机制使得提供方提取根据标准化的元数据格式配置的内容项。  The content processing module 307 also provides a mechanism for extracting content provider such items arranged according to a standardized metadata formats. 通过使用标准化的元数据格式类型并嵌入合适的属性到内容项中，一个提供方的客户端应用使得连接到位置资源服务209的其它提供方的其它客户端应用可以从内容项中提取信息，并接着在其它客户端应用的环境中使用所述提取的内容以及指向所述资源的链接。 Through metadata format type using standardized and embed the appropriate attributes to content items, a provider client application that is connected to the 209 positions resource service other client applications other provider information may be extracted from the content item, and then extracted using the content in an environment of other client applications and resources directed to the links. 同时，如果其它提供方的资源被依据标准化的元数据格式配置，一个提供方的客户端应用可以直接地从其它提供方的资源中提取内容。 Meanwhile, if the other party's resources are provided using standardized metadata formats configuration, a client-side application may provide content extracted directly from the resources of other providers. 换句话说，位置资源服务209提供标准化的元数据格式的技术基础设施用于这种交换。 In other words, the resource location services technology infrastructure 209 provides a standardized metadata format for this exchange. 由个人的客户端应用来同意对其它内容的合适的使用权力。 By the individual client applications to agree on the appropriate use of power other content. 控制逻辑301也与集成模块309相交互以集成网络服务(例如基于位置的服务)和位置资源服务209。  Control logic 301 may also interact with the integration module 309 to integrated services network (e.g., location-based service) and a location service resource 209. 集成模块309通过位置注册表201辅助外部资源（例如网站)和提供方的资源(例如服务网站、应用等)之间的链接。 The link between the integrated modules 309 through 201 locations in the registry auxiliary external resources (such as websites) and resource provider (eg service website, application, etc.). 作为一个例子，一个外部(移动）网站(例如旅店的预定服务)想从基于位置的服务被链接(例如地图、导航、旅行导航等）。 As an example, an external (mobile) website (eg scheduled service inn) want from location-based services are linked (eg maps, navigation, travel and navigation). 旅店预定服务提供方注册所有的旅店在位置注册表中，并接着在位置资源服务209中公布各个旅店预定页中的URL。 Hotel booking service providers register all the hotels in the location in the registry, and then publish each book hotel page URL in the location service resource 209. 当连接到位置资源服务209的网络地图服务搜索这些旅店中的一个时，搜索结果包含指向被搜索旅店的预订页面的链接。 When connected to a network resource location map search service 209 in one of these hotels, the search results include links to be searched hotel reservation page. 对于引用了位置并在网上的应用商店中可以获得的应用（例如网络地图应用）的开发者，集成模块309方便了对于位置数据和指向应用的部分的链接向注册表201进行手动的公开，其中所述部分包括位置。  a reference to the location of applications and can be obtained online application store (such as web map application) developers, to facilitate the integration module 309 links pointing to the location data and the application of section 201 to the registry manually It is disclosed, wherein said portion comprises position. 如果另一个提供方在注册表201中查看位置，其中该位置是被包括在网络地图应用中的，集成模块309检查是否对应的网络地图应用已经安装在所述另一个提供方的请求设备(例如手机等)上。 If another location in the registry view provider 201, where the position is included in the network map application, the integration module 309 checks whether a corresponding network device requesting a map application has been installed in the other provider (e.g. phone, etc.) on. 如果没有安装，则集成模块309创建一个从所述设备到在线应用商店的链接，以便所述设备的用户可以从所述在线应用商店获取网络地图应用的拷贝。 If not, the integration module 309 to create a link from the device to an online application store, so that the user equipment can obtain a copy from the web map applications online application store. 当所述网络地图应用已经安装在所述请求设备上时，集成模块309创建一个从请求设备到网络地图应用的搜索位置的超链接。 When the network map application has been installed on the device when the request, the integration module 309 to create a hyperlink to a request from the device to search for the location of the network map application. 从流行网站(例如Lonely Planet)到网络地图应用(例如本地城市向导）的超链接增加了其可被发现性。 From popular sites (such as Lonely Planet) to map network applications (such as local weather) increased hyperlinks that can be found in nature. 在另一个实施例中，网络地图应用A利用一特定的软件开发包(SDK)开发，其中所述的SDK使用网络技术，但是使得所述应用仅驻留在被安装有应用的设备上，并不能通过正常的超链接而被连接。  In another embodiment, the network map using a particular application A software development kit (SDK) to develop, the SDK uses wherein the internet, but only so that the application resides in the application device is mounted on, and not through normal hyperlinks are connected. 为了使得网络地图应用被另一个相同本质的网络地图应用B所“连接”，网络地图应用A、网络地图应用B被定义为具有其自己的“±或”，并且SDK提供机制以实现在两个域之间的“深链接”。 In order that the network map is applied to another application of the same nature as the network map B "connected," network map application A, application B the network map is defined as having its own "or ±", and the SDK provides two mechanisms to achieve between domains "deep link." 引用了位置的应用A的开发者手动地向注册表201公布位置数据和指向包括位置的应用的部分的深链接。  A reference to the developer of the application location to the registry 201 is manually released and the pointing position data linking section including deep application position. 如果应用B的用户在注册表201中查找包含在应用B中的一个位置， 集成模块309查看是否应用A已经被安装到正在进行请求的设备中。 If the position of a user of the application B 201 in the registry to find included in the application B, application integration module 309 to see if the device A has been mounted to the request in progress. 如果没有安装，集成模块309创建一个从所述设备到在线应用商店的链接，以便所述设备的用户可以从所述在线应用商店获取一个应用A的拷贝。 If not, the integration module 309 creates a link from the device to the online application store, so that the user equipment can be obtained from the online store a copy of the application A application. 当应用A已经安装在所述正在进行请求的设备中时，集成模块209创建一个从所述正在进行请求的设备到应用A的被搜索位置的深链接。 When the application has been installed in the apparatus A being the request, the integrated module 209 is to create a deep search positions to a link from the device A is being requested application. 该深链接允许跳离应用昭Ij在应用A中的URI上。 This link allows deep jump off the application Sho Ij URI of the application A. 因此，所述应用通过应用B获取了可被发现性。 Thus, the application acquired by the application B can be found in nature. 集成模块309也方便了基于位置服务的应用A隐含地公开所有的在其网站中的内嵌的内容项。  integration module 309 also convenient public location-based applications A service of all content items implicitly embedded in its website. 基于位置服务的应用A的包装格式使得可以附加元数据，该元数据包括一系列位置和它们资源(应用A的）。 A packaging format of location-based applications and services may be such that additional metadata, the metadata comprising a series of locations and their resources (application A). 作为在线应用商店的入口过程中的一部分，元数据被用于注册所有位置和它们的资源以及应用A在在线应用商店中的链接。 As part of the entry process of an online application store, metadata is used to position and register all resources and applications thereof A link of an online application store. 换句话说，集成模块309自动地基于适用于以特殊SDK来开发的基于位置应用的元数据来更新目录。 In other words, integration module 309 is automatically adapted to the special based SDK to develop the position-based metadata is updated catalog applications. 在这种情形下，该SDK隐含地创建资源元数据，以便开发者不用不得不，并且所有的对注册表201的处理可以由在线应用商店来做。 In this case, the SDK created implicitly resource metadata, so that developers do not have to, and all of the processing of the registry 201 may be done by the online application store. 集成模块309也方便了在所述位置注册表201之上所创建的基于位置服务应用去出售其服务。  The module 309 also facilitates the integration over the location registry 201 created based location services application to sell their services. 例如，一个基于位置服务应用C，其为特定的区域(例如纽约城），但不是单个的位置(例如意大利餐馆)提供内容/特征，可以公布一个指向基于位置服务应用D的链接，作为用于它们区域的位置的产品资源，其中该基于位置服务应用D在在线应用商店中可以获取到。 For example, a location-based service application C, which is a specific area (for example, New York City), but not a single location (such as Italian restaurant) providing content / features, you can publish a link to the location-based service applications D link, as a location of their area of ​​product resources, including the location-based service applications in the online application store D can be obtained. 作为在线信息商店的入口过程的一部分，这个可以基于一些基于位置服务应用的元数据而隐含地发生。 As part of the entry process online information store, this can take place based on some position-based metadata service applications and implicitly. 集成模块309方便了在所述位置注册表201之上所创建的应用对其产品/服务(例如冰淇淋商店)进行广告。  integrated module 309 to facilitate the application of the registry over 201 at the position created by advertising their products / services (such as ice cream shops). 商人(或者他们的广告商)可以公布产品/服务资源给所有的商店位置，在所述商店位置处消费者可以买到他们的产品/服务。 Businessman (or their advertisers) can advertise a product / service resources to all store locations in the store at the location of the consumer can buy their products / services. 集成模块309方便了在所述位置注册表201之上所创建的应用对内容项进行聚集。  The integration module 309 to facilitate the application registry 201 in the top position of the content items created aggregate. 对于特定资源类型（例如评论、产品等），基于位置服务应用可以希望聚集多个这样的资源为一个资源类型窗口，并基于一个或者多个标准整理跨多个资源内容项。 For a particular type of resource (such as reviews, product, etc. ), location-based services application may want to gather more resources for such a resource type window, and based on one or more criteria finishing resources across multiple content items. 在这个窗口中，基于资源类型规范可被提取出来的一些资源的摘要内容可以被显示到连接到位置资源服务209的客户端应用中。 In this window, the digest content of some resources based on the resource type specification that can be extracted may be displayed to the resources connected to the service location 209 in the client application. 作为一个例子，一个摘要可以是文章的起头段落、吸引观众的广告、获取关注的总结或者资源的突出点或者其结合。 As an example, a summary paragraph of the article may be beginning to attract the audience of advertising, get summarize the salient points or resource concern or a combination thereof. 图4A是依据一个实施例，通过一个协作注册表在实体间聚集和发布位置数据的处理的流程图。  FIG. 4A is accordance with one embodiment, a flowchart of processing aggregation and release position data between entities through a cooperative registry. 在一个实施例中，位置注册表201的位置资源服务应用107c执行流程400，并被实现在例如芯片组中，该芯片组包括处理器和存储器，如图11所示的。 In one embodiment, the location registry resource location service application execution process 201 107c 400, and implemented in, for example, a chipset, the chipset includes a processor and a memory, as shown in Figure 11. 在步骤401中，位置资源服务应用107c接收来自提供方的用于指明位置信息的输入，所述位置信息至少部分包括内容的描述，该内容从提供方可用并且与在一个地理地点（例如一个地址等)处的位置(例如旅店等)相关，所述位置信息进一步包括所述位置的位置标识符。 In step 401, location service resource for indicating the application 107c receives input position information from the provider, the location information comprises a description of the content at least partially, from the content provider may use a geographic location and with (e.g., an address location, etc.) at (e.g., hotel, etc. ), the location information further includes a location identifier of the location. 在一个实施例中，所述位置标识符在注册表中是全球唯一的。 In one embodiment, the identifier is globally unique location in the registry. 这个唯一标识符使得可以聚集位置信息，而不会在由不同提供方在不同私有ID或者不使用ID标识符引用位置的情形中产生混乱。 This unique identifier such that the location information may be aggregated, without causing confusion in the case of the provider or by different identifier ID is not used in the Private ID different reference location. 作为一个例子，在华盛顿特区的市中心的博物馆通常被称为“广场”。 As an example, the museum in downtown Washington, DC is often called "square." 一些人和本地报纸称其为“博物馆广场”来将其与常规的商业广场区分开。 Some people called the local newspaper to distinguish it from the "Museum Square" conventional commercial plaza area. 为了避免ID的混淆和重复，所述系统分配一个位置ID给所述的“广场”。 To avoid confusion and duplication of the ID, the system assigns a location ID to the "square." 所述位置ID可以是数字的或者字母的，只要其长度足够使各个ID在所述注册表中是唯一就可以。 The location ID may be a number or a letter as long as it is long enough so that each ID can be unique in the registry. 在另一个实施例中，位置标识符是在世界范围中唯一的。 In another embodiment, the location identifier is unique in the world. 换句话说，所述位置ID是普遍地可进行识别的，不会在任意的名字和/或ID域中重复。 In other words, the position of the ID can be identified universally, and will not be repeated an arbitrary name and / or ID fields. 位置资源服务应用107c从位置信息(至少部分地基于位置标识符）中确定位置(步骤403)。  The location of the resource location service application 107c is determined (step 403) (the identifier based on a position at least partially) from the position information. 位置资源服务应用107c至少部分地基于所述确定的位置，在注册表中，聚集该位置信息和从一个或者多个其它提供方可用的其它位置信息(步骤405)。 Resource location service application 107c at least in part on the determined position in the registry, and provide the location information gathered other location information (step 405) before use from one or more other. 位置资源服务应用107c决定公布注册表。  location of the resource service application 107c decision to publish the registry. 根据一个或者多个标准化的元数据格式，所述内容的描述被提供在所述注册表中（步骤407)。 According to one or more of the standardized metadata formats, the content description is provided in the registry (step 407). 位置资源服务应用107c决定获取对注册表的全部或部分的订阅，并至少部分地基于所述订阅接收一个或者多个对于注册表的更新（步骤409)。  resource location service subscription application 107c to determine access to all or part of the registry, and at least partially based on the subscription to receive one or more update the registry (step 409). 所述订阅可以用一个或者多个位置标识符而定义，并且所述订阅可以包括对应于一个或者多个位置标识符的内容元数据。 The subscription identifier can be defined by one or more positions, and may include the subscription corresponding to one or more location identifiers content metadata. 所述公布和订阅可以通过网络提要而被传输。 The publication and subscription may be transmitted through the network feed. 图4B是依据一个实施例，在图4A的步骤405之后继续的处理420的流程图。  FIG. 4B is accordance with one embodiment, the flowchart in step 420 of FIG. 4A after processing 405 continues. 在一个实施例中，位置注册表201的位置资源服务应用107c执行流程420,并被实现在例如包括处理器和存储器的芯片组中，如图11所示的。 In one embodiment, the location registry resource location service application execution process 201 107c 420, and implemented in, for example, a chip set including a processor and a memory, as shown in FIG. 11. 在步骤421中，位置资源服务应用107c确定一个或者多个资源以获取全部或者部分的内容。 In step 421, location service resource application 107c determines one or more resources to acquire all or part of the contents. 各个资源（例如相片、媒体文件、网站、数据库等)被一个或者多个资源标识符中的一个所标识出来，并且所述各个资源是一个位置相关的，所述位置与地理地点相关，并且所述对应的资源元数据具有按照资源类型的标准化的元数据格式。 Various resources (such as photos, media files, web sites, databases, etc.) with one or a plurality of resource identifiers identified out, and the resource is associated with a respective position, the position associated with the geographic location, and the said resources having metadata corresponding to metadata formats standardized in accordance with the resource type. 位置资源服务应用107c决定根据一个或者多个标准化的元数据格式，从一个或者多个资源中提取内容描述的全部或者部分(步骤423)。  where the resource is determined according to a service or application 107c plurality of standardized metadata formats, extracting all or part of the contents described or from a plurality of resources (step 423). 所述内容的描述包括内容元数据(例如名字、地址、内容类型、位置、地点、类别、联系方式等），并且所述内容元数据是被按照一个或者多个格式而标准化的。 The content includes content description metadata (e.g., name, address, type of content, location, location, type, contact information, etc. ), and the content metadata according to one or more of the standardized format. 所述内容元数据也包括内容标识符，所述内容标识符可以与用于其它提供方的统一资源定位符相关联，以链接一个或者多个资源、应用或者其组合到所述内容。 The content metadata also includes a content identifier, the content identifier may be associated with a uniform resource locator for other providers to link one or more resources, or a combination thereof applied to the content. 所述应用是被提供方用来提供服务的，其中所述服务引用位置、内容、内容的摘要等。 The application is used to provide a service provider, wherein said service reference location, content, etc. of the digest content. 因此，位置资源服务应用107c接着返回到步骤407运行，并确定公布注册表。 Therefore, the location of the resource service application 107c then returns to step 407 to run, and to determine the publication registry. 在另一个实施例中，一个统一资源定位符用于链接到应用，一个统一资源定位符用于链接到携带应用的在线应用商店。  In another embodiment, a Uniform Resource Locator used to link to the application, a uniform resource locator for linking to carry applications online application store. 所述位置资源服务应用l〇7c确定公布用于链接到应用的统一资源定位符，和用于链接到在线应用商店的统一资源定位符，以可被从一个或者多个资源、应用和其组合来进行访问。 The resource location service application publication l〇7c determined for linking to the application of a uniform resource locator, and a link to an online application store a uniform resource locator to be from one or more resources, applications, and combinations thereof be accessed. 此后，位置资源服务应用107c接着返回到步骤407运行，并确定公布注册表。 Since then, the location of the resource service application 107c then returns to step 407 to run, and to determine the publication registry. 在另一个实施例中，由资源标识符所标识出来的资源可以是一个引用了位置的现已存在的应用。  In another embodiment, the resource identifier can be identified out of a resource reference to the position of application is now present. 位置资源服务应用107c接收一从现存应用到另一/新的引用了位置的应用的链接，以及其他应用的标识符。 Location of the resource service application 107c receive / new reference links application location, and other identifiers from one application to another existing application. 位置资源服务应用l〇7c确定注册所述链接和其它应用的标识符，以可被访问。 Location of the resource service application l〇7c determine the registration link identifier and other applications to be accessed. 响应于来自于应用的对在其它应用中所引用的位置的一个查询，位置资源服务应用107c决定传输给所述应用一个其它应用的资源标识符和到所述在线应用商店的链接。 In response to an application from the position in other applications referenced in a query, the location services application 107c decided to transfer resources to a resource identifier of the application and other applications to link to the online application store. 图5A是依据一个实施例，通过一个协作注册表由一个服务注册和/或链接位置数据的处理的流程图。  FIG 5A is accordance with one embodiment, a collaboration by the registry and / or flowchart of a process by a service link position registration data. 在一个实施例中，服务（例如基于位置的服务）的位置资源服务应用l〇7c执行流程500,并被实现在例如图11所示的包括处理器和存储器的芯片组中。 In one embodiment, the service (e.g., location-based services) resource location service application l〇7c execution flow 500, and is implemented in a chip set including a processor and a memory 11, for example, in FIG. 在另一个实施例中，当服务提供方(例如提供一个简单的基于位置服务的个人)通过UElOla在进行操作时，处理500通过位置资源服务应用107a而被实施。 In another embodiment, when the service provider (e.g. a simple personal location-based services) through UElOla during operation, the position of the processing resource 500 by the application service 107a is implemented. 在步骤501中，位置资源服务应用107c在位置注册表中查询一个与地理地点相关的位置。  In step 501, the location of the resource service application 107c a query related to geographical location of a place in the location in the registry. 位置资源服务应用l〇7c接收至少一个资源的资源标识符，其中该资源是包含有描述了位置的资源元数据的（步骤503)。 Resource location services application l〇7c receiving at least one resource identifier for a resource, wherein the resource is described comprising resource metadata position (step 503). 位置资源服务应用107c使用该资源标识符链接一个或者多个涉及位置相关资源的网络服务到所述资源（步骤505)。 107c resource location service applications to use the resource identifier to link one or more network resources directed to positions of said service resource (step 505). 位置资源服务应用107c查询所述位置注册表以查找资源元数据（步骤507)。 Location of the resource service application 107c query the registry to find the location of the resource metadata (step 507). 位置资源服务应用107c接收所述资源元数据和一个指向包含所述资源元数据的资源的一部分的链接(步骤509)。 Resource location service application 107c receives the resource metadata and a link to the resource contains metadata portion of resources (step 509). 位置资源服务应用l〇7c使用所述链接将一个或者多个网络服务链接到所述资源的一部分(步骤511)。 L〇7c resource location service application using the link or a link to a portion of the plurality of network service resource (step 511). 位置资源服务应用107c决定使得呈现所述资源标识符和资源元数据，其中所述资源元数据包括位置的名字、所述位置的地址、所述位置的联系方式信息、所述位置的等级信息、所述位置的评论摘要或者其组合(步骤513)。 Location of the resource service application 107c decided to make presentation of the resource identifier and resource metadata, wherein the metadata includes level information resource location name, address of the location, the location of the contact information of the location, review summary of the location, or a combination thereof (step 513). 图5B是依据一个实施例，在图5A的步骤之后继续的处理520的流程图。  FIG 5B is accordance with one embodiment, the flowchart 520 of FIG. 5A, after the step of continuing processing. 在一个实施例中，基于位置服务的位置资源服务应用107c执行处理520,并被实施在如图11所示的包括有例如处理器和存储器的芯片组中。 In one embodiment, the resource location service application 107c performs processing location-based services 520, and in the embodiment 11 includes, for example, a processor and a chip set memory. 在步骤521中，位置资源服务应用107c响应于对所述资源元数据的查询，进一步地接收来自于位置注册表的一个查询，该查询是关于是否一个基于资源元数据而开发的应用被安装中用户终端中，其中所述用户终端访问着一个或者多个网络服务以获取所述位置。 In step 521, the location of the resource service application 107c response to a query to the resource metadata, and further receives a query from a registry location, the query is whether the application is mounted on a metadata based resource development in a user terminal, wherein the user terminal accesses the one or more network service to obtain the position. 位置资源服务应用l〇7c响应于所述来自于位置注册表的查询而决定是否所述应用被安装在所述用户终端中（步骤523)。 L〇7c resource location service response to the application from a location query the registry to decide whether the application is installed in the user terminal (step 523). 当所述应用被判定为还没有安装在所述用户终端中时，位置资源服务应用l〇7c决定下载所述应用到所述用户终端;或者当所述应用被判定为已经安装在所述用户终端中时通过一个深链接来链接一个或者多个网络服务到与所述资源元数据相关的应用的一部分中（步骤525)。 When it is determined that the application is not yet installed in the user terminal, determines the position of the resource service application l〇7c downloading the application to the user terminal; or when the application is determined to have been installed in the user are linked by a link to the terminal a deep or more network service (step 525) a portion of the application associated with the resource metadata. 位置资源服务应用107c响应于所述应用还没有安装在用户终端中的判定，进一步地接收所述应用的应用标识符和一个指向一个具有所述应用的商店的链接。 Determining location of the resource service application 107c in response to the application not yet installed in the user terminal, further receives an application identifier of the application and store a pointer to a link with the application. 位置资源服务应用l〇7c决定传输所述应用标识符和所述指向所述商店的链接到用户终端处。 L〇7c location of the resource to determine the transmission service application of the application identifier and the link to the store at the user terminal. 在另一个实施例中，位置注册表201的位置资源服务应用107c执行一个流程以从一个协作注册表中删除位置数据。  In another embodiment, the location registry resource location service application 107c 201 performed a process to remove from a position cooperating registry data. 位置资源服务应用l〇7c响应于一个由提供方从一个或者多个提供方的资源中删除位置的提示，从对应于一个或者多个资源的被注册资源元数据中删除位置。 Resource location service applications l〇7c a delete location response to the prompt from the one or more resources provided by the provider side, from a position corresponding to remove one or more resources to a resource element is registered data. 可选地，位置资源服务应用l〇7c响应于从提供方的所有资源中删除位置的提示， 从对应于所有资源的所有被注册的资源元数据中删除位置。 Alternatively, the location of the resource service application l〇7c in response to prompts to remove the location from all the resources provider, remove from the position corresponding to all the resources of all the registered resource metadata. 在另一个实施例中，位置资源服务应用107c响应于所述位置不存在的提示，从所有被注册的资源元数据中删除一个或者多个对所述位置的引用。 Embodiment, the location of the resource application of the service response to the prompt 107c of the location does not exist, deleting one or more reference positions from all the resource metadata is registered in another embodiment. 图6是依据一个实施例，通过一个协作注册表更新网络服务的位置数据的处理的流程图。  FIG. 6 is accordance with one embodiment, the processing flowchart of position data through a collaborative network service registry updates. 在一个实施例中，位置注册表201的位置资源服务应用107c执行处理600,并被实施在如图11所示的包括有例如处理器和存储器的芯片组中。 In one embodiment, the location registry resource location services application 201 of process 600 performed 107c, and in the embodiment 11 includes, for example, a processor and a chip set memory. 在步骤601中，位置资源服务应用l〇7c接收一组提供方已知的位置标识符。 In step 601, location service resource l〇7c application provider receives a set of known location identifiers. 在一个实施例中，例如在处理新位置转储之前，各个所述的已知位置被标上一个标记。 In one embodiment, for example in a new location before the dump process, the known position of each marker is a superscript. 所述标记提供简单的大量维护机制，以从在存档中的已知位置的集合中删除所有的被标记的位置。 The tag provides a simple mechanism for a lot of maintenance to the set from a known location in the archive to delete all of the marked location. 位置资源服务应用l〇7c将所述列表与所述注册表进行比较(步骤603)。 Resource location service application l〇7c the list (step 603) to the registry. 作为一个例子，位置资源服务应用107c将最近备份中的已知位置的标识符与位置注册表处的已知位置的标识符进行匹配。 As an example, location services application 107c resource identifier known location identifier and location in the registry at the most recent backup in known locations to match. 位置资源服务应用l〇7c至少部分地基于上述的比较决定更新所述注册表（步骤605)。 L〇7c resource location service application at least partly based on the above-described updating of the comparison determines the registry (step 605). 在一个实施例中，位置资源服务应用107c从所有已知位置的集合中的所有注册的/修改的位置中删除所述标记。 In one embodiment, the resource location service application 107c remove the tag from the set of all known positions of all modifications of the location registration / in. 一旦所有在转储中的位置被处理了，那么仅那些还被标记的位置为那些不再包含在最近转储中的位置。 Once all positions in the dump to be processed, then only those locations are also marked for those positions are no longer included in the most recent dump. 位置资源服务应用l〇7c接着以一个单一操作，从资源的已知位置的标识符列表中，删除掉还被标着标记的最近备份的已知位置的标识符。 Location of the resource service application l〇7c followed by a single operation, from the list of identifiers known location of the resource, the identifier is deleted also marked the last known location of the marker backup. 在一些实施例中，资源元数据在一个或者多个HTTP消息中被从一个节点传输到另一个节点。  In some embodiments, the resource metadata is transmitted in one or more HTTP messages from one node to another. 一个在HTTP消息中传输资源元数据的方式是在可扩展标记语言(XML)文件中包括所述资源元数据。 A transmission resource metadata embodiment is in extensible markup language message in HTTP (XML) file comprises the metadata resource. XML文件使得用于在目录中的一个或者多个预定参数中的任一个的值可以在可以访问所述目录的节点间进行交换。 XML file such that the value of any of the one or more predetermined parameters used in the directory may be exchanged between the nodes can access the directory. XML参数可以嵌套，并对于任意级别的嵌套， 可以以任意的顺序进行排列。 XML parameter can be nested, and the nesting level for any, may be arranged in any order. 图7是依据一个实施例，使用图4A和图5A中的位置发布处理的图示700。  FIG. 7 is an embodiment according to embodiment using FIGS. 4A and 5A illustrating processing release position 700. 在一个实施例中，位置资源服务(PRS)的提供方701可以在位置注册表703处公布一个其内容/服务的URL (例如Finnishtiki . com)，并公布描述所述内容的元数据（例如名字、地址、电话号码等）。 In one embodiment, the resource location service (PRS) provider 701 may registry at position 703 the contents of a publication / URL and services (e.g. Finnishtiki. Com), and the publication describes metadata of the content (e.g., name , address, phone number, etc.). 作为一个例子，所述位置是名称为Finnishtiki酒吧和餐馆。 As one example, the name of the location is Finnishtiki bars and restaurants. 提供方701可能是Finnishtiki的拥有者/管理者/网站站长等。 Provider 701 may be Finnishtiki owner / manager / webmaster and so on. 所述提供方701可能是一个旅行向导服务(例如Lonely Planet®)、城市观光客中心、本地商业社团、汽车倶乐部和休闲旅行组织(例如美国汽车协会)等。 The provider 701 may be a travel guide service (eg Lonely Planet®), the center of the city tourists, local business associations, automobile club is travel and leisure organizations (such as the American Automobile Association) and so on. 在处理707中公布的URL接着可以被其它位置资源服务(PRS) 209的用户所使用，以链接到他们的服务。  In processing the URL 707 published then can be used by other locations Resource Services (PRS) 209 users to link to their service. 所述其它的用户可能是其它的例如另一个基于位置服务705 (例如Ovi 地图）的提供方。 The other user may be other positions such as another service provider 705 based (e.g. Ovi map) is. 作为一个例子，在处理709中，基于位置服务705在位置注册表703处查找一个在圣地亚哥的新位置；接着从位置注册表703接收所述新位置的URL和元数据（包括Finnishtiki，其地址和电话号码）。 As an example, in the processing 709, to find a new location in the location-based service 705 San Diego at the location registry 703; then receives the URL and the new location metadata (including Finnishtiki, from its address and location registry 703 telephone number). 在处理711中，基于上述的URL，基于位置服务705链接其服务到新位置Finnishtiki酒吧和餐馆。 In the process 711, based on the above URL, location-based service 705 links its services to the new location Finnishtiki bars and restaurants. 通过处理713,提供方701也可以在位置注册表703中公布评论链接和/或摘要，要么是同时地带有URL或者是晚些时候再带上URL。  By processing 713, the provider 701 may also publish the comment link and / or summary at position 703 in the registry, either simultaneously or URL Strip later and then put URL. 在处理715中，当基于位置服务705查询新位置的评论/摘要时，位置注册表703将发送新位置的公开的评论链接和/或评论的摘要到基于位置服务705。 In the process 715, when the comment location-based service 705 queries the new location / summary, location registry 703 to send public comments link to the new location and summary / or comments to the location-based service 705. 在处理717中，基于位置服务705接着可以使用所述被公开的评论链接， 以链接其服务到新位置Finnishtiki酒吧和餐馆的全部评论中。 In the process 717, location-based service 705 can then use the comment link is open to all comments link their services to a new location Finnishtiki in bars and restaurants. 作为一个例子，所述评论可以包括一个对Finnishtiki的总体等级(例如为五星），以及具体的其食物、环境、服务、价格等的等级。 As an example, the review may include an overall rating of Finnishtiki (such as five-star), as well as their specific food, environment, service and price level. 所述评论的摘要可以包括“Finnishtiki是一个伟大的波利尼西亚人和芬兰人的餐馆。它可以在圣地亚哥的高档旅店的地下室层被发现。Finnishtiki已经经历了几个…”。 A summary of the comments may include "Finnishtiki is a great Polynesians and Finns restaurant. It can be found .Finnishtiki has gone through several layers in the basement of the upscale San Diego hotel is ...." 这个摘要内容接着可以被和URL—起进行显示。 This summary content can then be displayed and URL- play. 在这个实施例中，Finnishtiki . Com和基于位置服务705被混搭在一起。 In this embodiment, Finnishtiki. Com 705 and location-based services are mix together. 在一个实施例中，位置注册表703使用按照内容类型（例如评论、产品、工作、住房等)的标准化元数据格式来控制跨多个服务元数据(例如评价、摘要内容等）的公布，并方便了将平滑的数据混搭为单一的表示。  In one embodiment, the location registry 703 used in accordance with the type of content (e.g., comments, products, work, housing, etc.) of the standardized metadata formats across multiple controlling service metadata (e.g., abstracts content, etc.) published and facilitate the smooth mash of data into a single representation. 例如，所述标准化的元数据格式实现了在实体和提供方间的协作动作。 For example, the standardized metadata formats cooperative action is realized between the entity and the provider. 在另一个实施例中，基于位置服务705也组合来自多个源的不同的数据类型(例如组合Ovi地图和维基百科API)。 In another embodiment, the location-based service 705 is also a combination of different types of data (e.g., a combination of Ovi maps and Wikipedia API) from a plurality of sources. 在另一个实施例中，通过处理719提供方701在位置注册表703中公布评论链接(没有摘要）。  In another embodiment, provider 719 701 published reviews link 703 by treatment location registry (not abstract). 但是，所述元数据标准被嵌入在通过处理719从提供方701发送到位置注册表703 的内容中。 However, the metadata is embedded in the standard by the processing contents of the registry 703 is sent from the provider 719 to position 701. 基于所述元数据标准，通过处理721，位置注册表703可以直接从所述网站（例如Finnishtiki.com)中提取评论摘要内容。 Standard based on the metadata by processing 721, location registry 703 can be extracted directly from the content review summary website (e.g. Finnishtiki.com) in. 所述的评论摘要变得可在位置注册表703中获取。 The summary of comments made available at 703 locations in the registry. 因此，如果所述基于位置服务705如处理715中所做的那样查询新位置的评论/摘要，位置注册表703将发送公布的新位置评论链接和/或评论摘要到所述基于位置服务705。 Therefore, if the location-based services such as processing 705 queries comment as the new location / summary made 715, 703 to send the location of the registry announced a new comment link location and / or Review summary to the location-based service 705. 接着如处理717中那样，所述基于位置服务705可以使用公布的评论链接来链接其服务到一个新位置Finnishtiki酒吧和餐馆的全部评论。 Next, as the processing 717 as to link its services to a new location Finnishtiki bars and restaurants of all reviews of the location-based service 705 can use the published comments link. 在该实施例中，位置注册表703隐含地集成/混搭所述Finnishtiki . com和所述基于位置服务705。 In this embodiment, the location registry 703 implicitly integrated / the mash Finnishtiki. Com, and the location-based service 705. 因为相同的元数据机制也被搜索引擎所使用， 提供方不需要额外的工作来集成/混搭所述基于位置服务705。 Because the same metadata mechanisms have been used by search engines, no additional work providers to integrate / mix and match the location-based service 705. 图8是依据一个实施例，使用图4B和图5B中的应用混搭处理的图示800。  FIG. 8 is accordance with one embodiment, the application 800 uses the mashup processing illustrated in FIG. 4B and FIG. 5B. 前面所讨论的混搭特征也是适用于基于位置服务应用的，其中所述基于位置服务应用是由提供方801在位置注册表803之上所创建的。 Mashup feature discussed above are applicable to the location-based service application, wherein the location-based service provider 801 is applied over the location registry 803 is created. 在处理807中，提供方801开发了一个在位置注册表803 之上方的应用（例如Finnishtiki)，接着在处理809中将该应用公布在一个在线应用商店(例如Ovi商店）中。 In process 807, a provider application 801 developed in the upper position of the registry 803 (e.g. Finnishtiki), followed by the application process 809 published in an online application store (e.g. Ovi Store) in. 另外，在处理811中，提供方801在位置注册表803中公布应用深链接、摘要和指向在线应用商店的链接。 In addition, in the processing 811, 801 providers in 803 locations in the registry published application deep links, summaries and links to online application store. 此后，如果如在处理813中的那样，基于位置服务805查询了新位置的评论/摘要， 位置注册表803将发送公布的应用深链接、评论摘要和在线商店链接到基于位置服务805。  Since then, as if in the 813 as processing, location-based service 805 queries the location of new comments / summary, location registry 803 sends the published application deep links, comments, summaries and links to online stores location-based services 805 . 接着在处理815中，基于位置服务805检查是否所述应用被安装在本地。 Next, in process 815, the location service 805 checks based on whether the application is installed locally. 如果没有安装在本地，在处理817中，基于位置服务805使用所述在线商店链接从所述在线商店来安装应用。 If not installed locally, in the processing 817, location-based service 805 from the online store links to the online store using the installed application. 如果安装在了本地，在处理819中，基于位置服务805使用所述深链接来链接到所述应用。 If the installed locally, in the processing 819, the location-based service 805 using a deep link to link to the application. 前述的实施例通过位置注册表803为基于位置应用的可被发现提供了手段，其中所述位置注册表803是包含位置相关资源805网络服务的关键驱动组件。  The foregoing embodiments by location registry 803 based on the location of the application may be found to provide a means wherein the location registry 803 is a drive assembly comprising a key location associated resources and services network 805. 从位置注册表803 到已经安装的基于位置的应用的直接链接对于位置注册表803的用户来发现新的基于位置的应用是重要的。 From the position 803 to the registry has been installed based on the direct link to the app for position location registry 803 users to discover new location-based applications is important. 新的从基于位置应用注册的位置增加了位置注册表803的利益覆盖点。 The new location adds registry point of interest covering 803 from the position based on the location of the application for registration. 将位置注册表803建立为一个到基于位置应用的中心创建了营销和广告的机会。 The location of the registry 803 to establish marketing and advertising opportunities for the creation of a central location to based applications. 在一个实施例中，这可以适用于如前所讨论的使用SDK进行开发的基于位置应用。  In one embodiment, which may be suitable for location-based applications such as the SDK for development previously discussed. 尽管所述基于位置应用可以经常使用网路技术，它们与常规网站还是很不同的。 Although the location-based applications can often use Internet technology, and they are still very different from regular websites. 例如，这些基于位置应用不使用常规的超链接进行导航，并且不是存在于网络上（仅仅是存在于安装了所述应用的设备上）。 For example, these are not location-based application using conventional navigation hyperlinks, and not present in (only present in the device, the application is installed) on the network. 所述的SDK提供一种进行“深链接”到基于位置应用的域之中的机制，并且所述深链接被用于跳离一个停止的基于位置应用到另一个基于位置应用。 For the SDK provides a "deep link" into domain-based mechanism to position applications, and the link is used to jump off a depth stop location based application to another application based on location. 图9是依据一个实施例，图8中的处理的替代版本的图示900。  FIG. 9 is an example, an alternate version of the process 900 in FIG. 8 illustrates a basis embodiment. 描述在图8中的处理对少数技术提供方/公布方可能是一个挑战。 In the process described in Figure 8 of the few technology providers / publishing side it can be a challenge. 特别地是，与位置注册表API的集成可能是复杂的。 In particular, the location of the registry API integration can be complex. 同时，“长尾”的超本地提供方(例如具有有利可图项目的特殊利益的顾客)很感兴趣于扩张利益覆盖点，并可以通过在此处描述的位置数据聚集，可能地从“可被发现性”提供中获利。 Meanwhile, the "long tail" of the ultra-local providers (for example, the customer has a special interest in profitable projects) are very interested in expanding coverage points of interest, and location data can be gathered described herein, may be from the " It was found "of providing profit. 在图9的例子中，在处理907中提供方901开发一个在位置注册表903之上方的应用(例如Finnishtiki)，该应用具有内嵌摘要元数据;接着在处理907中，提供方901在在线应用商店(例如Ovi商店）中公布该应用。  In the example of FIG. 9, in the embedded application having the metadata digest process 907 to develop an application provider 901 over the location 903 of the registry (e.g. Finnishtiki); Next, in process 907, the provider 901 publication of the application in the online application store (such as Ovi store) in. 当提供方901在应用商店中公布一个应用时，所述应用商店从所述应用中提取元数据。 When the application provider 901 in a published application store, said store application extracts metadata from the application. 所有的图7中的通过与位置注册表703相交互来公布应用深链接、摘要内容和在线商店链接的过程在图9中在线商店和位置注册表903之间执行。 All the 7 position by the registry 703 interact to publish applications deep link, summary content and online store link between the registry during the execution of 903 in the online store and position 9. 在处理911中，所述在线商店在位置注册表903中公布应用深链接、摘要和在线商店链接。 In the process 911, the online store application publication deep links, summaries and links to online stores in 903 locations in the registry. 在一个实施例中，由在线商店提供的开发工具可以支持隐含的创建元数据，特别是创建位置。 In one embodiment, provided by the online store development tools to support the creation of hidden metadata, especially created position. 此后，如果如在处理913中那样，基于位置服务905查询新位置的评论/摘要，则位置注册表903将发送被公布的应用深链接、评论摘要和应用的在线商店链接到所述基于位置服务905。  Since then, as if in the process 913 as location-based service 905 queries the new location of comments / summary, the location registry 903 will be sent to Deep links are published comment summaries and online store applications linked to the 905 location-based services. 在处理915中，所述基于位置服务905接着检查是否所述应用在本地进行了安装。 In the process 915, the location-based service 905 then checks whether the application has been installed locally. 如果还没有安装，则在处理917中，基于位置服务905使用在线商店链接从所述在线商店中安装所述应用。 If you have not installed, then in process 917, the link to install the application from the online store location-based services using the 905 online stores. 如果所述应用在本地被安装了，则在过程919中，基于位置服务905使用所述深链接来链接到所述应用。 If the application is installed locally, then in process 919, the location-based service 905 using a deep link to link to the application. 于此描述的用于通过协作注册表在实体间聚集和链接位置数据的处理可以有利地通过软件、硬件、固件或者软件和/或固件和/或硬件的组合来实施。  as described herein for gathering and processing of data link position by cooperation between entities registry can advantageously be implemented by software, hardware, firmware or software, or a combination and / or firmware and / or hardware. 例如，于此描述的包括提供与服务的可获取性相关的用户界面导航信息的处理，可以有利地通过处理器、数字信号处理(DSP)芯片、专用集成电路(ASIC)、现场可编程门阵列(FPGA)等来实施。 For example, the user interface process described herein navigational information comprises providing services related to accessibility, it can be advantageously by the processor, a digital signal processing (DSP) chips, application specific integrated circuit (ASIC), a field programmable gate array (FPGA), etc. FIG. 这样的用于执行所述功能的示范性硬件在下面将描述。 Such exemplary hardware for performing the function will be described below. 图10描述了一个计算机系统1000,在其中可以实施本发明的实施例。  Figure 10 depicts a computer system 1000, which may be implemented in embodiments of the present invention. 尽管计算机系统1000被描述为针对于特殊的设备或者装置，但是可以设想的是在图10中的其它设备或者装置(例如网络单元、服务器等)可以部署系统1000的所示硬件和组件。 Although computer system 1000 is described as being directed to a particular device or devices, it is contemplated that other devices or means (e.g. a network element, a server, etc.) in FIG. 10 may be deployed and hardware components of the system shown in 1000. 计算机系统1000 被编程(例如通过计算机程序代码或者指令）以如此所述的通过协作注册表在实体间聚集和/或链接位置数据，并且计算机系统1000包括诸如总线1010的通信机制，以在计算机系统1000的其它内部和外部组件之间传递信息。 The computer system 1000 is programmed (e.g. by computer program code or instructions) in such a registry by cooperation of the aggregation and / or position data links between entities, and the computer system 1000 includes a communication mechanism such as a bus 1010 to a computer system passing information between other internal and external components 1000. 信息(也称为数据)被表示为可测量现象的物理展示，典型地为电压值，但是在其它实施例中包括诸如磁的、电磁的、压力的、化学的、生物的、分子的、原子的、次原子的和量子交互的现象。 Information (also called data) is represented as a measurable physical phenomena display, typically a voltage value, but such phenomena as magnetic, electromagnetic, pressure, in other embodiments, chemical, biological, molecules, atoms the phenomenon of sub-atomic and quantum interactions. 例如，北极磁场和南极磁场，或者零电压和非零电压，表示二进制数字（比特）的两个状态(〇, 1)。 For example, magnetic north and south magnetic fields, or a zero voltage and zero voltage represents a binary digit (bit) of the two states (square, 1). 其它现象可以表示更高基数的数字。 Other phenomena can represent digits of a higher base. 在测量之前多个同时的量子状态的叠加表示一个量子比特(qubit)。 Prior to the measurement of superposition of multiple simultaneous quantum states represents a quantum bit (qubit). 一个或者多个数字的序列构成了数字数据，其中该数字数据被用于表示字符的编号或者编码。 Of one or more digital sequence of digital data, wherein the digital data are used to denote the number or character encoding. 在一些实施例中，称为模拟数据的信息通过在一个特定的范围中的近连续的可测量值表示。 In some embodiments, information called analog data is represented by a specific range of near continuum of measurable values. 计算机系统1000或者其部分构成了一个装置，其用于执行通过一个协作注册表在实体间聚集和链接位置数据的步骤中的一个或者多个步骤。 Computer system 1000, or portions thereof constitutes a means for performing one or more of the steps and steps aggregate link position data entities through a collaboration of the registry. 处理器(或者多个处理器）1002执行一组信息的操作，所述信息操作由计算机程序代码指定，其中所述计算机程序代码与通过协作注册表在实体间聚集和/或链接位置数据相关。  processor (or multiple processors) 1002 to perform a set operation information, the operation information specified by the computer program code, wherein the computer program code registry gathered by cooperation between entities and / or link location data related. 所述计算机程序代码是一组指令或者语句，其提供用于处理器和/或计算机系统进行操作以执行特定功能的指令。 The computer program code is a set of instructions or statements, which provides for a processor and / or the computer system operable to perform a certain function. 所述代码例如可以由计算机编程语言所编写，其被编译为处理器的原生指令集。 The codes may be written, for example, by a computer programming language, which is compiled into a native instruction set of the processor. 所述代码也可以直接使用原生指令集(例如机器语言）而编写。 The code can also be used as the native instruction set (e.g., machine language) written. 所述操作集包括从总线1010引入信息和置信息于总线1010中。 The set of operations include the introduction of information and position information from the bus 1010 to the bus 1010. 所述操作集也一般地包括比较两个或者多个信息单元，移动信息单元的位置以及组合两个或者多个信息单元，例如通过加或者乘或者逻辑操作例如“或”、“异或(XOR)”和“与”。 The set of operations also typically include comparing two or more units of information, the position information of the mobile unit, and combinations of two or more units of information, such as by addition or multiplication or logical operations such as "or", "exclusive OR (XOR ) "and" and. " 通过称为指令的信息，例如带有一个或者多个数位的操作码，向处理器表示可被处理器所执行的所述操作集中的各个操作。 By information called instructions, such as with one or more digit operation code indicating the operation of the respective operations may be executed by the processor in the processor set. 由处理器1002所执行的操作序列，例如操作码序列，形成处理器指令，其也称为计算机系统指令或者简单地为计算机指令。 By a sequence of operations performed by the processor 1002, such as operating code sequence processor instructions is formed, which is also referred to as simply a computer system instructions or computer instructions. 处理器可以被单独地实施为机械的、电的、磁的、光学的、化学的或者量子的组件，或者实施为它们的组合。 The processor may be implemented separately as a mechanical, electrical, magnetic, optical, or quantum chemical components, or as a combination thereof. 计算机系统1000也包括连接到总线1010的存储器1004。  Computer system 1000 also includes memory 1010 coupled to bus 1004. 存储器1004例如随机访问存储器(RAM)或者其它的动态存储设备，保存了信息，该信息包括用于通过协作注册表在实体间聚集和链接位置数据的处理器指令。 The memory 1004 such as random access memory (RAM) or other dynamic storage device, to save the information, which includes processor instructions for gathering location data and links between entities through collaboration registry. 动态存储器使得保存于其中的信息可以被计算机系统1000所改变。 Such that information stored in the dynamic memory which can be changed by the computer system 1000. RAM使得保存在称为存储器地址的位置处的信息单元可以独立于在相邻的地址处的信息而保存和读取。 Such that information stored in RAM unit at a location called a memory address may be independent of the address information at the adjacent read and saved. 存储器1004也被处理器1002所使用以在处理器指令的执行期间，存储临时的值。 Also to memory 1004 during execution of processor instructions, temporary storage values ​​used processor 1002. 计算机系统1 〇〇〇也包括连接到总线1 〇I 〇的只读存储器(ROM) 1006或者其它的静态存储设备，以用于存储静态信息，所述静态信息包括不会被计算机系统1000改变的指令。 The computer system 1 also includes a connection to the bus 〇〇〇 a read only memory (a ROM) 1 billion 〇I 1006 or other static storage device for storing static information, said static information comprises 1000 will not be changed by the computer system instruction. 一些存储器由易失性存储器所构成，其在失去电源时丢失存储在其中的信息。 Some memory is composed of a volatile memory, which loss of information stored therein at the time of loss of power. 连接到总线1010的还有一个非易失性(永久性)存储设备1008,例如磁盘、光盘或者闪存卡，以存储包括指令的信息，该信息即使在计算机系统1000被关闭电源或者其它失去电源的情况时还会存在。 1010 connected to the bus there is a non-volatile (persistent) storage device 1008, such as magnetic disk, optical disk, or a flash memory card, to store information including instructions, the information even when the computer system 1000 is turned off or loses power other when the situation will continue to exist. 从外部的输入设备1012,例如由人类用户操作的包含字母键的键盘或者传感器， 向所述总线1010提供包括用于通过协作注册表在实体间聚集和链接位置数据的指令的信息以便由所述处理器进行使用。  from an external input device 1012 such as a keyboard or a sensor comprises letter keys operated by a human user, aggregation and instructions for providing a data link position by cooperation between entities registry information to the bus 1010 to for use by the processor. 一个传感器检测在其周围的状态，并将这些检测转换为与可测量现象相适配的物理表述，以在计算机系统1000中表示信息。 A sensor for detecting the state around it, and transforms those detections into physical expression of a measurable phenomenon and adapted to represent information in computer system 1000. 其它的连接到总线1010 的外部设施，其主要是用于与人类相交互，包括:显示器设备1014,例如阴极射线管(CRT)或者液晶显示器(LCD)或者等离子体屏幕或者打印机，其用于呈现文字或者图像；以及定点设备1016,例如鼠标或者跟踪球或者光标导向键或者移动传感器，其用于控制呈现在显示器1014上的小光标图像的位置，并输出与呈现在显示器1014上的图像元素相关的指令。 Other external facilities connected to the bus 1010, which is mainly used to interact with the human, comprising: a display device 1014, such as a cathode ray tube (CRT) or a liquid crystal display (LCD) or a plasma screen or printer, for presenting text or an image; a position and a pointing device 1016 such as a mouse or a trackball, or cursor keys or guide motion sensor for controlling the presentation on a display of a small cursor image 1014, and outputs the image is presented on a display element 1014 associated instructions. 在一些实施例中，例如在计算机系统1000自动地执行所有的功能而没有人的输入的实施例中， 一个或者多个外部的输入设备1012、显示器设备1014和定点设备1016可以被省去。 In some embodiments, for example, in the computer system 1000 performs all functions automatically without human input embodiment, one or more external input device 1012, a display device 1014 and pointing device 1016 may be omitted. 在所描述的实施例中，特殊目的的硬件，例如专用集成电路(ASIC) 1020被连接到总线1010。  In the described embodiment, special purpose hardware such as application specific integrated circuit (ASIC) 1020 is connected to the bus 1010. 所述特殊目的的硬件出于特殊的目的，被配置为足够快地执行不是由处理器1002所执行的操作。 The special purpose hardware for special purposes, is configured to perform operations not performed by processor 1002 quickly enough. 专用IC的例子包括:用于为显示器1014产生图像的图像加速卡、用于对在网络中进行传输的消息进行加密和解密操作的密码板、语音识别，和到特殊外部设备的接口，例如重复地执行一些复杂的操作序列的机器人臂和医疗扫描设备，其中所述的复杂的操作序列被更高效地以硬件实施。 Examples of specific IC comprising: means for generating a display image 1014 of the image accelerator cards, an interface for cryptographic boards for transmission of messages in a network of encryption and decryption operations, speech recognition, and to special external devices, such as repeated perform some complex sequence of operations of the robot arm and medical scanning equipment, wherein said sequence of complex operations are more efficiently implemented in hardware. 计算机系统1000也包括一个或者多个连接到总线的通信接口1070的实例。  Computer system 1000 also includes a communication interface 1070 Examples of one or more buses connected to. 通信接口1070提供一个单向或者双向通信耦合到多个外部设备，例如打印机、扫描仪和外部磁盘， 其中所述外部设备具有自己的处理器进行操作。 The communication interface 1070 provides a two-way communication or one-way coupled to a plurality of external devices, such as printers, scanners and external disks, wherein the external device has its own processor operates. 通常地，所述耦合利用网络链接1078实现的，其中网络链接1078是与本地网络1080相连接的，而且有多个具有自己的处理器的外部设备被连接到本地网络1080。 Generally, the network link 1078 implemented using a coupling, wherein the network link 1078 is connected to the local network 1080, and a plurality of external devices with their own processors are connected to the local network 1080. 例如，通信接口1070可以是个人电脑上的并行端口或者串行端口或者通用串行总线(USB)端口。 For example, communication interface 1070 may be a parallel port or a serial port or a universal serial bus (USB) port on a personal computer. 在一些实施例中，通信接口1070是一个综合业务数字网(ISDN)卡或者数字用户线路(DSL)卡或者电话调制解调器，其提供信息通信连接到对应类型的电话线。 In some embodiments, the communication interface 1070 is an integrated services digital network (ISDN) card or a digital subscriber line (DSL) card or a telephone modem that provides an information communication connection to a corresponding type of telephone line. 在一些实施例中，通信接口1070是一个有线调制解调器，其转换在总线1010上的信号为用于在同轴电缆上进行通信连接的信号，或者转换在总线1010上的信号为用于在光纤线缆上进行通信连接的光信号。 In some embodiments, the communication interface 1070 is a cable modem that converts signals on bus 1010 signal for a communication connection over a coaxial cable or switching signal on the bus 1010 for the optical fiber optical signal on a communication connection cable. 作为另一个例子，通信接口1070可以是局域网（LAN) 卡，以提供数据通信连接到适配的LAN，例如以太网。 As another example, communication interface 1070 may be a local area network (LAN) card to provide a data communication connection adapted to the LAN, such as Ethernet. 也可以实施无线链接。 Wireless links can also be implemented. 对于无线链接， 通信接口1070发送或者接收或者发送和接收电学的、声音的或者电磁的信号，包括红外和光学信号，所述的信号可以携带诸如数字数据的信息流。 For wireless links, the communications interface 1070 sends or receives or transmits and receives electrical, acoustic or electromagnetic signals, including infrared and optical signals, the signals may carry information streams, such as digital data. 例如，在无线手持设备，例如诸如蜂窝电话的移动电话中，通信接口包括频带电磁发射器和接收器，其被称为无线电收发机。 For example, in wireless handheld devices, such as cellular telephones for example, a mobile phone, the communication interface includes a band electromagnetic transmitter and a receiver, which is called a radio transceiver. 在某些实施例中，通信接口1070使得通过通信网络105连接到UElOla，以通过协作注册表在实体间聚集和链接位置数据。 In certain embodiments, the communication interface 1070 that is connected to the communication network 105 via UElOla, and to aggregate data link position by cooperation between entities registry. 于此所使用的术语“计算机可读介质”指的是任意参与向处理器1002提供包括用于执行的指令的信息的介质。  As used herein the term "computer readable medium" refers to any medium that participates in providing information includes instructions for execution to the processor 1002. 这样的介质可以采用很多种形式，包括但不限于计算机可读存储介质(例如非易失性介质，易失性介质)和传输介质。 Such a medium may take many forms, including but not limited to computer readable storage media (e.g., non-volatile media, volatile media), and transmission media. 非短暂性介质例如非易失性介质， 包括例如诸如存储设备1008的光盘或者磁盘。 Non-transitory medium, such as nonvolatile media, including, for example, optical or magnetic disks, such as storage device 1008. 易失性介质包括例如动态存储器1004。 Volatile media include dynamic memory, for example, 1004. 传输介质包括例如同轴电缆、铜线、光缆，和没有线或者电缆经空间进行传输的载波，例如声波和电磁波，其包括无线的、光学的和红外的波。 Transmission media includes, for example, coaxial cables, fiber optic cable, or a cable line, and there is no space for transmission by a carrier, such as acoustic waves and electromagnetic, including radio, optical and infrared waves. 信号包括经过传输介质传输的在幅值、频率、 相位、极性或其它物理属性上的人造瞬态变化。 Artificial signal comprising transient variations in amplitude, frequency, phase, polarity, or other physical property of the via transmission medium. 计算机可读介质的通常形式包括例如软盘、 软磁盘、硬盘、磁带、任意其它的磁性介质、00-如1、^1^、0¥0、任意其它的光学介质、穿孔卡、纸带、光学标记表、任意其它的带有孔结构或者其它光学可识别标记的物理介质、RAM、 PROM、EPROM、FLASH-EPROM、任意其它的存储芯片或盒、载波、或任意其它的计算机可读的介质。 Common forms of computer-readable media include, for example, a floppy disk, hard disk, magnetic tape, any other magnetic medium, such as 00- 1, ^ 1 ^, 0 ¥ 0, any other optical medium, punch cards, paper tape, optical mark table, any other structure provided with holes or other optically recognizable physical medium mark, RAM, PROM, EPROM, FLASH-EPROM, any other memory chip or cartridge, a carrier wave, or any other computer-readable medium. 术语计算机可读存储介质在此使用为指任意计算机可读的介质，而不包括传输介质。 The term computer-readable storage medium used herein to refer to any computer-readable medium, and does not include a transmission medium. 编码在一个或者多个有形介质中的逻辑包括有在计算机可读存储介质和特殊目的硬件例如ASIC 1020上的处理器指令中的一个或全部。  Logic encoded in one or more tangible media readable storage medium comprises a special purpose hardware and computer instructions on a processor, one or all of the ASIC 1020 in the example. 网络链接1078—般使用传输介质经过一个或者多个网络来提供信息通信到其它的使用或者处理所述信息的设备。  Network link 1078 used as a transmission medium via one or more networks to provide information to other communication apparatus using or processing the information. 例如，网络链接1078可以通过本地网络1080来提供到主机计算机1082或者由因特网服务提供方（ISP)所运行的设备1084的连接。 For example, network link 1078 may provide a connection apparatus or a host computer 1082 by an Internet Service Provider (ISP) 1084 running through local network 1080. ISP设备1084经过现在通常称为因特网1090的网络中的公开的、世界范围中的分组交换通信网络，提供数据通信服务。 ISP equipment 1084 through the now commonly referred to as a packet-switched communication networks of the Internet network in 1090 disclosed the world, provides data communication services. 连接到因特网的称为服务器主机1092的计算机驻留一个进程，该进程响应于通过所述因特网所接收到的信息提供一种服务。 Computer called a server host 1092.  connected to the Internet, a resident process, the process of providing a service in response to information received via the Internet. 例如服务器主机1092驻留一个进程以提供信息，该信息表示了用于在显示器1014呈现的视频数据。 For example, server 1092 resides a host process to provide information that indicates the video data for presentation on the display 1014. 可以设想是系统1000中的组件可以被部署在各种在其它计算机系统，例如主机1082和服务器1092中的配置中。 It is contemplated that a component of the system 1000 may be deployed in other computer systems, such as host servers 1082 and 1092 in a variety of configurations. 至少一些本发明的实施例与使用计算机系统1000以实施一些或者全部的于此所描述的技术相关。  At least some embodiments of the present invention using the computer system 1000 to implement some or all of the techniques described herein related. 根据本发明的实施例，响应于处理器1002执行包含在存储器1004中的一个或者多个处理器指令的一个或者多个序列，计算机系统1000执行这些技术。 According to an embodiment of the present invention, in response to processor 1002 executing one or more sequences of computer system includes one or more processor instructions in the memory 1004 is 1000 to execute these techniques. 这些也称为计算机指令、软件和程序代码的指令可以从另一计算机可读介质，例如存储设备1008或者网络链接1078被读入到存储器1004中。 These are also known as computer instructions, and the instructions of the software program code may be from another computer-readable medium, such as storage device 1008 or the network link 1078 is read into the memory 1004. 所述包含在存储器1004中的指令序列的执行使得处理器1002去执行一个或者多个于此描述的方法步骤。 The execution sequences of instructions contained in memory 1004 causes processor 1002 to perform one or more of the method steps described herein. 在一个可选的实施例中，例如ASIC1020的硬件可以被用于取代软件或者与软件相结合的方式来实现本发明。 In an alternative embodiment, for example ASIC1020 hardware may be used in place of or in combination with means of software to implement the invention. 因此，本发明的实施例并不限于任何的硬件和软件的特定组合，于此明确声明的除外。 Thus, embodiments of the present invention is not limited to any specific combination of hardware and software, except expressly stated herein. 经过通信接口1070在网络链接1078和其它网络上传输的信号中携带有发往和来自于计算机系统1000的信息。  The communication interface 1070 via the signal transmission on the network link 1078 and other network carries the information sent to and from computer system 1000. 计算机系统1000可以经过网络1080、1090、通过网络链接1078 和通信接口1070来发送和接收包括程序代码的信息。 Computer system 1000 may be via the network 1080, 1090, transmitted over network link 1078 and communication interface 1070 and receive information, including program code. 在一个使用因特网1090的例子中，月艮务器主机1092经过因特网1090、ISP设备1084、本地网络1080和通信接口1070,传输由一个计算机1 〇〇〇发送来的消息所请求的特定应用的程序代码。 Particular application program in an example of using the Internet 1090, a month that works to host 1092 through 1090, the ISP equipment 1084, 1080, and a communication interface 1070, a transmission message transmitted from one computer to a local network Internet 〇〇〇 requested code. 所述被接收的代码在其被接收时可以被处理器1002所执行，或者可以被保存在存储器1004或存储设备1008或其它非易失性存储器中用于后期进行执行，或者是上述的两种方案都可以采纳。 The received code may be executed by the processor 1002 as it is received, or may be stored in memory 1004 or storage device 1008, or other non-volatile memory for post-execution, or both of the above program can be adopted. 以这种方式，计算机系统1000可以获取在载波上的信号的形式的应用程序代码。 In this manner, computer system 1000 may obtain in the form of a carrier wave signal application code. 计算机可读介质的各种形式可能涉及运送一个或者多个指令或者数据或者这两者的序列到处理器1002进行执行。  Various forms of computer-readable media may be involved in one or more sequences of instructions or data or both of these to processor 1002 for execution. 例如，指令和数据起初承载在诸如1082主机的远程计算机的磁盘上。 For example, instructions and data initially carried on a magnetic disk of a remote computer, such as a 1082 host. 所述远程计算机加载所述指令和数据到其动态存储器中，并使用调制解调器通过电话线发送所述指令和数据。 The remote computer loads the instructions and data into its dynamic memory and send the instructions using a modem over a telephone line and data. 在计算机系统1000本地的调制解调器在电话线上接收所述指令和数据，并使用红外发射机来转变所述指令和数据为用作网络连接1078的红外载波上的信号。 A modem local to the computer system 1000 receives the instructions and data on a telephone line and use an infrared transmitter to said shift command and data signals on an infrared carrier 1078 is used as the network connection. 一个用作通信接口1070的红外检测器接收携带在所述红外信号中的所述指令和数据，并将表示所述指令和数据的信息置于总线1010上。 A communication interface 1070 is used as an infrared detector receives the infrared signal carrying the instructions and data, and information representing the instructions and data on bus 1010. 总线1010运送所述信息到存储器1004,其中处理器1002从所述存储器1004中获取所述指令，并使用一些随所述指令发送的数据来执行所述指令。 1010 conveying the information to a memory bus 1004, where the processor 1002 obtains the instructions from the memory 1004, and use some of the data transmitted with the instruction to execute the instruction. 所述接收在存储器1004中的指令和数据可选地被存储在存储设备1008中，或者在处理器1002执行之前或者在处理器1002执行之后。 The memory 1004 receives instructions and data optionally be stored on storage device 1008, the processor 1002 either before or after execution processor 1002 performs. 图11描述了芯片组或者芯片1100,本发明的实施例可以实施在这些芯片或芯片组中。  Figure 11 depicts a chipset or chip 1100, embodiments of the present invention may be implemented in such a chip or chipset. 芯片组1100被编程为如于此所描述的通过协作注册表在实体间聚集和/或链接位置数据，这些芯片组包括例如在图10中所描述的处理器和存储器，其被整合在一个或者多个物理封装中（例如芯片）。 Chipset 1100 is programmed by the cooperation registry as described herein aggregation and / or position data links between entities, the chip set including a processor and a memory in FIG. 10, for example, as described, or it is integrated in a a plurality of physical package (e.g. chip). 作为一个例子，物理封装包括一个或者多个在结构组件(例如基板） 上的电线、组件、和/或材料，以提供一个或者多个例如物理强度、存储量和/或电交互的限制的特征。 As an example, a physical package includes one or more wires, components, and / or material on a structural assembly (e.g. substrate), to provide one or more features such as limiting the physical strength, storage and / or electrical interaction . 可以设想的是在一些实施例中，芯片组1100可以被实施在一个单一芯片中。 It is contemplated that in some embodiments, the chipset 1100 may be implemented in a single chip. 进一步地可以设想的是，在一些实施例中芯片组或者芯片1100可以被实施为单一的“片上系统”。 Further, it is contemplated that in some embodiments the chip set or chip 1100 embodiment may be implemented as a single "system on a chip." 进一步地可以设想的是在一些实施例中，单独的ASIC可以不被使用，例如，于此揭示的所有相关的功能可以被一个处理器或者多个处理器所执行。 Further, it is contemplated that in some embodiments, a separate ASIC may not be used, for example, all the functions disclosed herein may be executed by a processor or multiple processors. 芯片组或者芯片Iioo或者其部分构成了一种装置，该装置可以用于执行一个或者多个步骤以提供与服务的可获得性相关的用户界面导航信息。 Iioo chip or chip set, or part thereof constitutes an apparatus, the apparatus may be used to perform one or more steps related to the availability of a user interface providing navigation information and services. 芯片组或者芯片1100或者其部分构成了一种装置，该装置可以用于执行一个或者多个步骤以通过协作注册表在实体间聚集和链接位置数据。 1100 chip or chip set, or part thereof constitutes an apparatus, the apparatus may be used to perform one or more steps to gather and link position data registry through collaboration between entities. 在一个实施例中，芯片组或芯片1100包括一个通信机制，例如用于在芯片组1100 的组件之中传递信息的总线1101。  In one embodiment, the chip set or chip 1100 includes a communication mechanism such as a bus 1101 to transfer information among the components of the chip set 1100. 处理器1103与总线1101相连接，以执行保存在例如存储器1105中的指令和处理信息。 The processor 1103 coupled with bus 1101, for example, to execute instructions stored in the memory and processing information 1105. 处理器1103可以包括一个或者多个处理核，其中各个处理核配置为单独地进行运行。 The processor 1103 may include one or more processing cores, wherein each processing core is configured to be run separately. 多核处理器使得可以在单物理封装中进行多任务处理。 Such that the multi-core processor may be multi-tasking in a single physical package. 例如多核处理器包括两个、四个、八个或者更多数量的处理核。 Multi-core processor, for example, include two, four, eight or more of the number of processing cores. 可替换地或者附加地，所述处理器1103可以包括一个或者多个微处理器，其被配置为经过总线1101而被串联以使得指令、流水线、多线程可以独立地进行执行。 Alternatively or additionally, the processor 1103 may include one or more microprocessors, which is configured to be connected in series via the bus 1101 such that the instructions, pipelining, multiple threads can be executed independently. 处理器1103也可能是附带有一个或者多个特定组件的， 例如一个或者多个数字信号处理器（DSP) 1107、或者一个或者多个特定应用集成电路(ASIC) 1109,以执行特定的处理功能和任务。 The processor 1103 may also be accompanied by one or more specific components, such as one or more digital signal processors (DSP) 1107, or one or more application specific integrated circuits (ASIC) 1109, to perform a particular processing function and tasks. 通常地DSP 1107被配置为实时地独立于处理器1103地处理真实世界中的信号（例如声音）。 Typically DSP 1107 is configured independently of the processor in real-time signal processing (eg voice) to the real world of 1103. 相似地，ASIC1109可以被配置为执行不能由一个通用目的的处理器简单地所执行的特定功能。 Similarly, ASIC1109 may be configured to perform a specific function can not simply be performed by a general purpose processor. 其它的以辅助执行于此描述的发明性功能的特定组件可以包括一个或者多个现场可编程门阵列(FPGA)(未示出），一个或者多个控制器(未示出)或者一个或者多个其它特定目的计算机芯片。 Other specific components to assist in the implementation of the inventive functions described herein may include one or more field programmable gate arrays (the FPGA) (not shown), one or more controllers (not shown), or a multiple or other more specific purpose computer chips. 在一个实施例中，芯片组或芯片1100仅仅包括一个或者多个处理器和一些软件和/或固件，其支持和/或相关于和/或用于一个或者多个处理器。  In one embodiment, the chip set or chip 1100 includes only one or more processors and some software and / or firmware, which supports and / or associated with and / or one or more processors. 处理器1103和附带的组件通过总线1101连接到存储器1105。  Components included with the processor 1103 and a memory 1105 coupled to bus 1101. 存储器1105包括用于存储可执行指令的动态存储器（例如RAM、磁盘、可写光盘等）和静态存储器（例如R0M、CD-ROM等），其中所述指令在其被执行时完成于此描述的发明性的步骤以通过协作注册表在实体间聚集和/或链接位置数据。 The memory 1105 includes dynamic memory (e.g., RAM, magnetic disk, optical disk, etc. writable) and a static memory (e.g. R0M, CD-ROM, etc.) for storing executable instructions, wherein the instructions described herein in complete when it is executed invention in the step of aggregation and / or data link location registry through collaboration between entities. 存储器1105也保存数据，该数据与所述的发明性步骤的执行相关或者由其产生。 The memory 1105 also save data, the data associated with the execution of the inventive step, or generated therefrom. [0M1]图12是依据一个实施例，用于通信的移动终端(例如手机）的示例性组件的图，其中所述移动终端可以运行在图1所示的系统中。 [0M1] FIG. 12 is accordance with one embodiment, a mobile terminal (e.g. a mobile phone) FIG exemplary components of a communication, wherein the mobile terminal may run on the system shown in FIG. 在一些实施例中，移动终端1200或者其部分构成了一个装置，该装置用于执行用于通过协作注册表在实体间聚集和链接位置数据的步骤中的一个或者多个。 In some embodiments, the step, the mobile terminal 1200, or portion thereof constitutes a means for collecting and for performing data link position by cooperation between entities in a registry or more. 一般地，无线接收器通常是根据前端和后端特性来进行定义的。 Generally, a radio receiver is often defined according to characteristics of the front and rear ends. 接收机的前端包含所有的射频(RF)电路，而接收机的后端包含所有的基带处理电路。 All front-end receiver comprising a radio frequency (RF) circuitry whereas the back-end of the receiver baseband processing circuitry comprising all. 如在本申请中所使用的，属于“电路”指的是以下的两者：（1)仅硬件实现(例如仅在模拟和/或数字电路中实现)和（2)电路和软件(和/或固件）的结合（例如如果适用于特定的环境，指处理器(包括数字信号处理器）、软件和存储器的组合，它们一起工作，以使得例如移动电话或者服务器的装置执行各种功能）。 As used in this application, a "circuit" refers to the following two: (1) hardware-only implementations (e.g. implemented only in analog and / or digital circuitry), and (2) circuitry and software (and / or firmware) binding (e.g., if applicable to a particular environment, refers to a processor (including a digital signal processor) a combination of software and memory, that work together, so that the device, such as a mobile phone or server, to perform various functions). 这种“电路”的定义适用于所有在本申请中对该术语的使用，包括在任意权利要求中。 This definition of "circuitry" applies to all use of the term in this application, including in any claims. 作为一个进一步的例子，如在本申请所使用的那样，并且如果适用于特定的环境，所述术语“电路”也可以涵盖仅一个处理器(或者多个处理器)和其(或它们的） 附带软件/或固件的实施情形。 As a further example, as used herein above, and, if applicable to a particular environment, the term "circuitry" may encompass only a processor (or multiple processors) and its (or their) accompanying software / or firmware implementation scenarios. 如果适用于特定的环境，所述术语“电路”也可以涵盖例如在移动电话中的应用处理器集成电路或者基带集成电路，或者在蜂窝网络设备或其它网络设备中的相似集成电路。 If applicable to a particular environment, the term "circuit" may also encompass an integrated circuit such as an application processor or baseband integrated circuit in a mobile phone or a similar integrated circuit in a cellular network device or other network devices. 电话的相关的内部组件包括:主控制单元(MCU) 1203,数字信号处理器①SP) 1205 和接收器/发送器单元，其包括麦克风增益控制单元和扬声器增益控制单元。  associated internal components of the telephone comprising: a main control unit (MCU) 1203, a digital signal processor ①SP) 1205 and the receiver / transmitter unit including a microphone gain control unit and a speaker gain control unit. 主显示器单元1207向用户提供显示器以支持执行或者支持通过协作注册表在实体间聚集和链接位置数据的步骤各种应用和移动终端功能。 A main display unit 1207 provides a display to the user in support of steps perform or support of various applications and mobile terminal and a function of collecting location data link through collaboration between entities registry. 显示器12包括显示电路，其被配置为显示移动终端(例如移动电话)的至少一部分的用户界面。 Display 12 includes display circuitry configured to display the mobile terminal (e.g. a mobile phone) at least a portion of the user interface. 此外，显示器1207和显示电路被配置为方便用户对至少一些移动终端的功能的控制。 In addition, the display 1207 and display circuitry configured to facilitate user control of at least some functions of the mobile terminal. 一个声音功能电路1209包括麦克风1211和麦克风放大器，该麦克风放大器放大了从麦克风1211输出的语音信号。 A voice function circuitry 1209 includes a microphone 1211 and microphone amplifier that amplifies the microphone output voice signal from the microphone 1211. 所述从麦克风1211输出的被放大后的语音信号被提供到编码器/译码器(编译码器CODEC) 1213。 The speech signal output from the microphone 1211 is amplified from being supplied to the encoder / decoder (codec CODEC) 1213. 无线部分1215放大功率，并转换频率以通过天线1217与包括在移动通信系统中的基站相通信。  radio section 1215 amplifies power and converts frequency in the antenna 1217 through communication with the mobile communication system comprises a base station. 功率放大器(PA) 1219和发射/调制电路操作性地响应于主控制单元(MCT) 1203,其中PA1219的输出被连接到现有技术中公知的双工器1221或者循环器或者天线开关。 The power amplifier (PA) 1219 and the transmitter / modulation circuitry are operationally responsive to the master control unit (MCT) 1203, PA1219 wherein the output is connected to the prior art known to the duplexer 1221 or circulator or antenna switch. PAl 219也被连接到电池接口和电源控制单元1220。 PAl 219 is also connected to a battery interface and power control unit 1220. 在使用中，移动终端1201的用户向麦克风1211讲话，这样他的或者她的声音和任何检测到的背景噪音一起被转变为模拟电压。  In use, the user of the mobile terminal 1201 speak into the microphone 1211, so that his or her voice and any detected background noise is converted into an analog voltage together. 所述模拟电压接着通过模拟数字转换器(ADC) 1223被转变为数字信号。 The analog voltage is then converted by an analog-digital converter (ADC) 1223 into a digital signal. 控制单元1203将所述数字信号发送到DSP1205以在其中进行处理，例如语音编码、信道编码、加密和交织。 The control unit 1203 transmits to the DSP1205 digital signal to be processed therein, such as speech encoding, channel encoding, encrypting, and interleaving. 在一个实施例中，被处理的声音信号由没有单独地示出的单元使用蜂窝传输协议所编码，其中所述的蜂窝传输协议例如为全球演进(EDGE)、通用分组无线业务(GPRS)、全球移动通信系统(GSM)、IP多媒体子系统（IMS)、通用移动通信系统(UMTS)等，以及其它合适的无线介质，例如微波接入(WiMX)、长期演进(LTE) 网络、码分多址(CDM)、宽带码分多址(WCDM)、无线保真(WiFi)、卫星等等。 In one embodiment, the sound signal is processed for use by units not separately illustrated encoding a cellular transmission protocol, wherein the cellular transmission protocol, for example, global evolution (EDGE), General Packet Radio Service (GPRS), global the mobile communication system (GSM), IP multimedia subsystem (the IMS), universal mobile telecommunications system (UMTS), etc., as well as other suitable wireless medium, for example microwave access (WiMX), long term evolution (LTE) network, Code Division Multiple access (CDM), wideband CDMA (WCDM), wireless fidelity (WiFi), satellite, etc..
 编码信号接着被传输到均衡器1225以补偿任何在通过空中的传输过程中出现的频率有关的损伤，例如相位和幅值失真。  encoded signal is then transmitted to the equalizer 1225 to compensate for any damage associated frequency of occurrence during transmission over the air, such as phase and amplitude distortion. 在均衡所述比特流之后，调制器1227将所述信号与在RF接口1229所产生的射频信号结合起来。 After equalizing the bit stream, the modulator 1227 with a signal in a radio frequency signal generated by the RF interface 1229 together. 调制器1227通过频率或者相位调制产生一个正弦波。 Modulator 1227 generates a sine wave by way of frequency or phase modulation. 为了准备用于传输的信号，上转变器1231组合调制器1227输出的正弦波和另一个由合成器1233所产生的正弦波，以获得所需传输频率。 In order to prepare the signal for transmission, and the other output of the sine wave on the transition composition modulator 1231 1227 1233 sine wave generated by a synthesizer to obtain a desired transmission frequency. 所述信号接着被发送通过PA1219,以增加信号到一个合适的功率级别。 The signal is then sent through PA1219, to increase the signal to an appropriate power level. 在实际的系统中，PA1219作为一可变增益放大器，其增益是依据从网络基站接收的信息而被DSP1205所控制。 In a practical system, PA1219 as a variable gain amplifier whose gain is based on information received from a network base station is controlled by DSP1205. 所述信号接着在双工器1221中被过滤，并且可选地所述信号被发送到天线耦合器1235中以匹配阻抗来提供最大功率的传输。 The signal is then filtered within the duplexer 1221 and optionally said signal is sent to an antenna coupler 1235 to match impedances to provide maximum power transfer. 最后， 所述信号通过天线1217被发送到一个本地基站。 Finally, the signal is transmitted to a local base station via the antenna 1217. 一个自动增益控制(AGO可以被提供来控制所述接收器在最后阶段的增益。所述信号可能被从那儿转发到一个远方的电话处，所述远方的电话可能是另一个蜂窝电话、其它移动电话或者是连接到公共交换电话网(PSTN)或者其它电话网络的座机。 An automatic gain control (AGO may be provided to control the receiver gain at the final stage. The signals may be forwarded from there to a telephone at a distance, the remote phone may be another cellular telephone, other mobile telephone or a landline connection to a public switched telephone network (PSTN), or other telephony networks. 传输到移动终端1201的声音信号通过天线1217而被接收，并马上被低噪音放大器(LNA) 1237所放大。  transmitted to the mobile terminal 1201 is a voice signal received by the antenna 1217, and immediately a low noise amplifier (LNA) 1237 amplified. 下转变器1239降低载波频率，而解调器1241剥离出RF仅留下数字比特流。 The mutator 1239 lowers the carrier frequency while the demodulator 1241 release the RF leaving only a digital bit stream. 接着信号通过均衡器1225并被DSP1205所处理。 The signal is then processed through the equalizer 1225 and DSP1205. 数字模拟转换器(DAC) 1243进行信号的转换，并将结果输出通过扬声器1245而发送给用户，上述的所有这些都是在主控制单元(MCU) 1203的控制之下的一该MCU可以实施为中央处理单元(CPU)(未示出）。 Digital to analog converter (DAC) 1243 converts the signal, and outputs the result to the user through the speaker 1245, all of which are in the main control unit (MCU) The MCU under the control of a 1203 may be implemented as a central processing unit (CPU) (not shown). MCU1203接收各种信号，包括来自于键盘1247的输入信号。  MCU1203 receives various signals including input signals from the keyboard 1247. 键盘1247和/或MCU1203 与其它用户输入组件(例如麦克风1211)相组合构成了用于管理用户输入的用户接口电路。 Combining the keyboard 1247 and / or other user input MCU1203 components (e.g., a microphone 1211) constitute a user interface circuitry for managing user input. M⑶1203运行一个用户接口软件以方便用户对移动终端1201的至少一些功能进行控制，从而通过协作注册表在实体间聚集和/或链接位置数据。 M⑶1203 user interface software to run a user at least some functions of the mobile terminal 1201 is controlled so that aggregation and / or data link location registry through collaboration between entities. MCU1203也分别地分发显示指令和开关指令到显示器1207和语音输出开关控制器。 MCU1203 respectively show distributed and switching commands to the display controller 1207 and the voice output switch. 进一步地，MCU1203与DSP1205交换信息，并可以访问一个可选地并入进来的SM卡1249和存储器1251。 Further, the MCU 1203 exchanges information DSP1205, and can access an optionally incorporated come in a SM card 1249 and a memory 1251. 此外，M⑶1203执行各种由终端所需的控制功能。 Further, M⑶1203 executes various control functions required by the terminal. 基于实施的情况，DSP1205可能执行对声音信号的多个传统数字处理功能中的任意一个或多个。 Based on the case of the embodiment, DSP1205 may perform any number of conventional digital processing functions of the audio signal in one or more. 此外，DSP1205从麦克风1211所检测到的信号中确定本地环境的背景噪音等级，并设置麦克风1211的增益到一个选择来补偿移动终端1201用户的自然倾向的级别。 Additionally, DSP 1205 determines the background noise level of the local environment from the signals detected by the microphone 1211, the microphone 1211 and sets the gain to a level selected to compensate for the natural tendency of the user of the mobile terminal 1201. 编译码器1213包括模拟数字转换器ADC1223和数字模拟转换器DAC1243。  codec 1213 includes an analog to digital converter and a digital to analog converter ADC1223 DAC1243. 存储器1251保存各种数据，该数据包括来电声音数据，并可以用于保存包括音乐数据的其它数据， 其中所述音乐数据例如是通过全局因特网接收的。 The memory 1251 stores various data that includes audio data call, and may be used to store other data including music data, wherein the music data for example received via the Internet globally. 软件模块可以驻留于RAM存储器、闪存、 寄存器或者任意其它的现有技术中所公知的可写存储介质中。 A software module may reside in RAM memory, flash memory, registers, or any other well known in the prior art writable storage medium. 所述存储器设备1251可以是，但不限于是，单一的存储器、CD、DVD、ROM、RAM、EEPROM、光学存储器或者任意其它的可以存储数字数据的非易失性存储介质。 The memory device 1251 may be, but not limited to, a single memory, CD, DVD, ROM, RAM, EEPROM, optical storage, or may be any other nonvolatile storage medium capable of storing digital data. 一个可选的并入进来的S頂卡1249携带例如重要信息，例如蜂窝电话号码、运营商提供的服务、订阅细节和安全信息。  An optional incorporation came in 1249 S top card carries instance, important information, such as the cellular phone number, the services provided by the operator, subscription details, and security information. SIM卡1249主要用于在无线网络中标识移动终端1201。 SIM card 1249 is mainly used for identifying the mobile terminal in a wireless network 1201. 卡1249也包含一个存储器，以用于存储个人电话号码注册表、文字消息和用户特定的移动终端设置。 Card 1249 also contains a memory for storing a personal telephone number registry, text messages, and user specific mobile terminal is provided. 虽然结合一些例子和实施对本发明进行了描述，但是本发明不被限制于此，而是可涵盖各种改变和等同的配置，这些都是在所附权利要求的范围之内的。  Although in connection with some examples and embodiments of the present invention has been described, but the present invention is not limited thereto, but may cover various modifications and equivalent arrangements, which are within the scope of the appended claims to. 尽管本发明的特征被表达为权利要求项之间的一些组合，但是可以设想的是这些特征可以以任何组合和顺序进行配置。 Although features of the present invention is expressed as some combination of claim between items, it is contemplated that these features can be arranged in any combination and order. 1. 一种用于聚集和链接位置数据的方法，包括方便访问至少一个接口以允许访问至少一个服务，所述服务配置为至少执行下述操作： 接收来自提供方的用于指明位置信息的输入，所述位置信息至少部分包括从所述提供方可用的与在地理地点处的位置相关的内容的描述； 从所述位置信息确定所述位置； 确定一个或者多个资源以获取所述内容的全部或者部分； 确定依据一个或者多个标准化的元数据格式从所述一个或者多个资源中提取所述内容的描述的全部或者部分； 在注册表中，至少部分地基于所述确定的位置，聚集所述位置信息和从一个或者多个其它提供方可用的其它位置信息；以及确定公布所述注册表。 1. A method of gathering location data and for linking, including facilitating access to at least one interface to allow access to at least one service, said service is configured to perform at least the following: receive input from the provider of the information for indicating the position the location information comprises at least in part from the description and providing relevant content at the location of the geographic position before use; determining said position from said position information; determining one or more resources to acquire the content all or portion; determined in accordance with one or more standardized metadata formats described extracting all or part of the content from the one or more resources; in the registry, at least in part on the determined position aggregating the position information and other location information from one or more other provider may use; and determining the released registry. 2. 如权利要求1所述的方法，其中所述位置信息进一步包括与所述位置相关的位置标识符，并且其中所述位置的确定是至少部分地基于所述位置标识符的。 2. The method according to claim 1, wherein the location information further comprises location associated with the location identifier, and wherein determining the location is at least in part on the location identifier. 3. 如权利要求1所述的方法，其中所述服务进一步配置为执行： 确定获取对所述注册表的全部或者部分的订阅；以及至少部分地基于所述订阅，接收对所述注册表的一个或者多个更新。 3. The method according to claim 1, wherein the service is further configured to perform: determining a subscription to obtain all or part of the registry; and at least partially based on the subscription, receiving the registry one or more updates. 4. 如权利要求3所述的方法，其中所述公布和所述订阅中的至少一个是通过一个或者多个网络提要所传输的。 4. The method according to claim 3, wherein the publication and subscription of said at least one feed through one or more networks transmitted. 5. 如权利要求3所述的方法，其中所述内容元数据与指向所述内容的统一资源标识符相关联。 5. The method of claim 3, wherein the uniform resource identifier pointing to the content metadata associated with the content request. 6. 如权利要求1所述的方法，其中所述内容的描述至少部分地标识一个或者多个相关应用、服务、资源或其组合。 6. The method according to claim 1, wherein the content described at least partially identifying the one or more associated applications, services, resources, or combinations thereof. 7. 如权利要求1所述的方法，其中所述服务进一步被配置为执行： 确定至少部分地基于以下中的至少一个从所述注册表中删除所述位置信息： 删除所述位置信息的请求； 所述位置已经在所述提供方的服务中被删除的提示； 所述位置不存在的确定。 The request for deleting location information: 7. The method of claim 1, wherein the service is further configured to perform: determining at least partially delete the location information from the registry based on at least one of ; said position has been deleted in the service provider in the tips; the determined position does not exist. 8. 如权利要求1-7中任一项所述的方法，其中所述服务进一步被配置为执行： 接收所述提供方已知的位置标识符的列表； 比较所述列表和所述注册表；以及至少部分地基于所述比较，确定对所述注册表进行更新。 8. A method as claimed in any one of claims 1-7, wherein the service is further configured to perform: receiving the provider list of known location identifier; comparing the list and the registry ; and at least in part on the comparison, determining to update the registry. 9. 一种用于聚集和链接位置数据的设备，包括： 用于接收来自提供方的用于指明位置信息的输入的装置，所述位置信息至少部分包括从所述提供方可用的与在地理地点处的位置相关的内容的描述； 用于从所述位置信息确定所述位置的装置； 用于确定一个或者多个资源以获取所述内容的全部或者部分的装置； 用于确定依据一个或者多个标准化的元数据格式从所述一个或者多个资源中提取所述内容的描述的全部或者部分的装置； 用于在注册表中，至少部分地基于所述确定的位置，聚集所述位置信息和从一个或者多个其它提供方可用的其它位置信息的装置;以及用于确定公布所述注册表的装置。 9. An apparatus and a link aggregation location data, comprising: means for receiving an input from a provider for indicating the position information, the position information comprises providing at least a portion of the geographic used only from the describe the position of associated contents at the location; means for determining said position from said position information; means for determining one or more resources for all or part of the content device; means for determining in accordance with one or all or part of the apparatus described in the content of a plurality of standardized extract metadata format from the one or more resources; for registry, at least in part on the determined position, the position of the aggregate It means the position information and the other information provided from one or more other before use; and means for determining said released registry. 10. 如权利要求9所述的设备，其中所述位置信息进一步包括与所述位置相关的位置标识符，并且其中所述位置的确定至少部分地基于所述位置标识符。 10. The apparatus according to claim 9, wherein the location information further comprises location associated with the location identifier, and wherein determining the position of at least partially based on the location identifier. 11. 一种用于聚集和链接位置数据的方法，包括： 接收来自提供方的用于指明位置信息的输入，所述位置信息至少部分包括从所述提供方可用的与在地理地点处的位置相关的内容的描述； 从所述位置信息确定所述位置； 确定一个或者多个资源以获取所述内容的全部或者部分； 确定依据一个或者多个标准化的元数据格式从所述一个或者多个资源中提取所述内容的描述的全部或者部分； 在注册表中，至少部分地基于所述确定的位置，聚集所述位置信息和从一个或者多个其它提供方可用的其它位置信息；以及确定公布所述注册表。 11. A method of gathering location data and for linking, comprising: receiving an input for indicating the position information from the provider, the location information comprises at least in part from the provider may use the geographic location at the site description of the Related content; determining said position from said position information; determining one or more resources to acquire the whole or part of the content; determining in accordance with one or more standardized metadata format from the one or more extracting all or part of the resources of the content description; in the registry, at least in part on the determined position, the position information and gathering information from other locations to provide one or more other before use; and determining announced the registry. 12. 如权利要求11所述的方法，其中所述位置信息进一步包括与所述位置相关的位置标识符，并且其中所述位置的确定至少部分地基于所述位置标识符。 12. The method of claim 11, wherein the location information further comprises location associated with the location identifier, and wherein determining the position of at least partially based on the location identifier. 13. 如权利要求11所述的方法，进一步包括： 确定获取对所述注册表的全部或者部分的订阅；以及至少部分地基于所述订阅，接收对所述注册表的一个或者多个更新。 13. The method of claim 11, further comprising: determining subscription acquiring all or a portion of the registry; and at least partially based on the subscription, receiving one or more of the registry update. 14. 如权利要求13所述的方法，其中所述公布和所述订阅中的至少一个是通过一个或者多个网络提要所传输的。 14. The method according to claim 13, wherein the publish and subscribe to the at least one feed through one or more networks transmitted. 15. 如权利要求13所述的方法，其中所述内容元数据与指向所述内容的统一资源标识符相关联。 15. The method according to claim 13, wherein said uniform resource content directed to the content metadata associated with the identifier. 16. 如权利要求11所述的方法，其中所述内容的描述至少部分地标识一个或者多个相关应用、服务、资源或其组合。 16. The method of claim 11, wherein the content described at least in part identifies one or more associated applications, services, resources, or combinations thereof. 17. 如权利要求11所述的方法，进一步包括： 确定至少部分地基于以下中的至少一个从所述注册表中删除所述位置信息： 删除所述位置信息的请求； 所述位置已经在提供方的服务中被删除的提示； 所述位置不存在的确定。 17. The method of claim 11, further comprising: determining at least in part on the at least one deleted from the location information in the registry: the request for deleting location information; the location has provided side prompt service is deleted; the determined position does not exist. 18. 如权利要求11所述的方法，进一步包括： 接收所述提供方已知的位置标识符的列表； 比较所述列表和所述注册表；以及至少部分地基于所述比较，确定对所述注册表进行更新。 18. The method of claim 11, further comprising: a recipient list of known location identifier to the providing; comparing the list and the registry; and at least in part on the comparison, the determination of It said the registry is updated. 19. 一种用于聚集和链接位置数据的设备，包括： 至少一个处理器；以及至少一个存储器，其中包括用于一个或者多个程序的计算机程序代码，所述至少一个存储器和所述计算机程序代码被配置为与所述至少一个处理器一起使得所述设备至少执行： 接收来自提供方的用于指明位置信息的输入，所述位置信息至少部分包括从所述提供方可用的与在地理地点处的位置相关的内容的描述； 从所述位置信息确定所述位置； 确定一个或者多个资源以获取所述内容的全部或者部分； 确定依据一个或者多个标准化的元数据格式从所述一个或者多个资源中提取所述内容的描述的全部或者部分； 在注册表中，至少部分地基于所述确定的位置，聚集所述位置信息和从一个或者多个其它提供方可用的其它位置信息；以及确定公布所述注册表。 19. An apparatus for linking and aggregation location data, comprising: at least one processor; and at least one memory including computer program code for one or more programs, the at least one memory and the computer program code configured to, with the at least one processor, cause the apparatus at least to perform: receiving an input for indicating the position information from the provider, the location information comprises at least a portion of the geographic location from the provider may use description related to a position at; determining said position from said position information; determining one or more resources to acquire the whole or part of the content; determining in accordance with one or more standardized metadata format from the one other location information in the registry, at least in part on the determined position, and the location information gathered from one or more other provider may use; or more resources extracting all or part of the contents described ; and determining publish the registry. 20. 如权利要求19所述的设备，其中所述位置信息进一步包括与所述位置相关的位置标识符，并且其中所述位置的确定至少部分地基于所述位置标识符。 20. The apparatus of claim 19 wherein determining the position and at least partially based on the location identifier, wherein the location information further comprises location associated with the location identifier. 21. 如权利要求19所述的设备，其中所述设备进一步被使得为： 确定获取对所述注册表的全部或者部分的订阅；以及至少部分地基于所述订阅，接收对所述注册表的一个或者多个更新。 21. The apparatus according to claim 19, wherein the apparatus is further caused to: determine access all the registry or subscribe portion; and at least partially based on the subscription, receiving the registry one or more updates. 22. 如权利要求21所述的设备，其中所述公布和所述订阅中的至少一个是通过一个或者多个网络提要所传输的。 22. The apparatus according to claim 21, wherein the publish and subscribe to the at least one feed through one or more networks transmitted. 23. 如权利要求21所述的设备，其中所述内容元数据与指向所述内容的统一资源标识符相关联。 23. The apparatus according to claim 21, wherein the content and metadata of the content points to a uniform resource identifier. 24. 如权利要求19所述的设备，其中所述内容的描述至少部分地标识一个或者多个相关应用、服务、资源或其组合。 24. The apparatus according to claim 19, wherein the content described at least in part identifies one or more associated applications, services, resources, or combinations thereof. 25. 如权利要求19所述的设备，其中所述设备进一步被使得为： 确定至少部分地基于以下中的至少一个从所述注册表中删除所述位置信息： 删除所述位置信息的请求； 所述位置已经在提供方的服务中被删除的提示； 所述位置不存在的确定。 25. The apparatus according to claim 19, wherein the apparatus is further caused to: determine at least in part, on at least one of the following information from the registry deletes the position: deleting the location information request; the position has been suggested in the service provider's deleted; determining the position does not exist. 26. 如权利要求19-25中任一权利要求所述的设备，其中所述设备进一步被使得为：接收所述提供方已知的位置标识的列表； 比较所述列表和所述注册表；以及至少部分地基于所述比较，确定对所述注册表进行更新。 26. The apparatus according to any one of claims 19 to 25 claim, wherein the apparatus is further caused to: receive the list of known location provider identifier; comparing the list and the registry; and at least in part on the comparison, determining to update the registry. 27. 如权利要求26所述的设备，其中所述设备为移动电话，进一步包括： 用户接口电路和用户接口软件，被配置为通过使用显示器方便用户对至少一些移动电话功能的控制，并被配置为对用户的输入进行响应;以及显示器和显示器电路，被配置为显示移动电话的用户接口的至少一部分，并且所述显示器和显示器电路被配置为方便用户对至少一些移动电话功能的控制。 27. The apparatus according to claim 26, wherein said apparatus is a mobile phone, further comprising: a user interface circuitry and user interface software is configured to facilitate user control of the display by using at least some of the mobile phone function and is configured It is performed in response to user input; and a display and display circuitry, configured to display the user interface of the mobile phone at least a portion, and the display and display circuitry configured to facilitate user control of at least some of the mobile telephone function. 28. —种设备，其包括用于执行权利要求13-18中任一权利要求所述方法的装置。 28. - kind of apparatus comprising means for performing any one of claims 13-18 in the method as claimed in claim apparatus. 29. 如权利要求28所述的设备，其中所述设备为移动电话，其进一步包括： 用户接口电路和用户接口软件，被配置为通过使用显示器方便用户对至少一些移动电话功能的控制，并被配置为对用户的输入进行响应;以及显示器和显示器电路，被配置为显示移动电话的用户接口的至少一部分，并且所述显示器和显示器电路被配置为方便用户对至少一些移动电话功能的控制。 29. The apparatus according to claim 28, wherein said apparatus is a mobile phone, further comprising: a user interface circuitry and user interface software is configured to facilitate user control of the display by using at least some of the mobile phone function, and configured to respond to user input; and a display and display circuitry configured to display at least a portion of the user interface of the mobile phone, and the display and display circuitry configured to facilitate user control of at least some of the mobile telephone function.